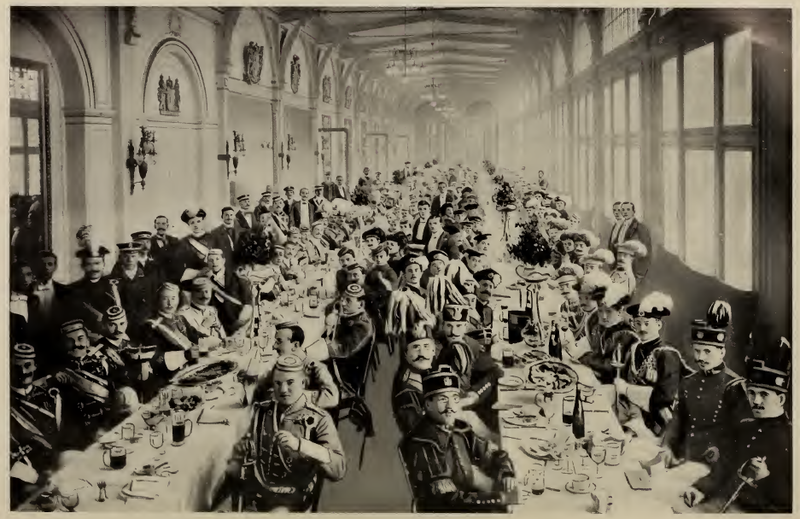 During the early 1900s a French journalist named Jules Huret spent a number of years in Germany, and published two books in 1912 and 1913 based on his reports sent back to Le Figaro. The way he described being in the country is so riveting that you almost feel as if you are there with him, seeing Germany as it was during the very last moments of Europe's long period of peace. As the book is in French I translated one third of Huret's books and published it on Lulu Press, and hope to do the remainder when I have the opportunity. 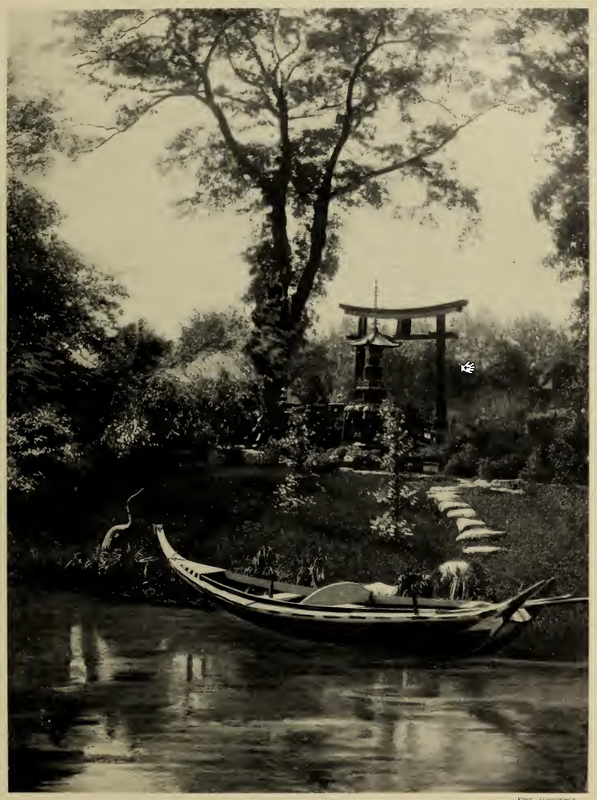 What also makes the books interesting however is the large number of photographs, very rare for a book this old. 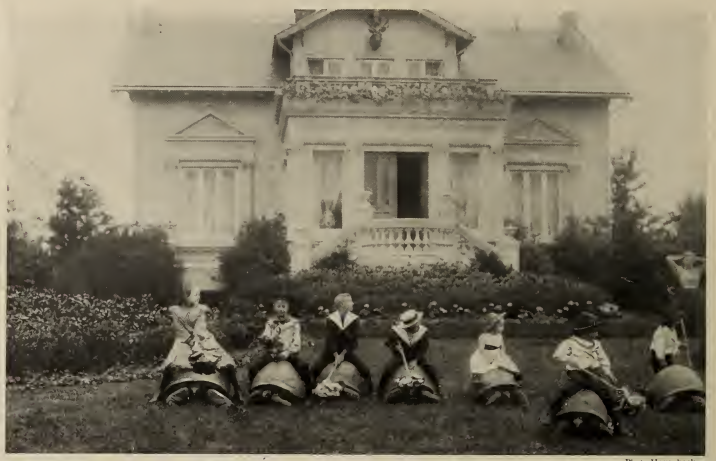 The two have some 500 photographs in total, and are all captioned. I have gathered them together here and translated the captions, sometimes haphazardly because it really is a *lot* of content. 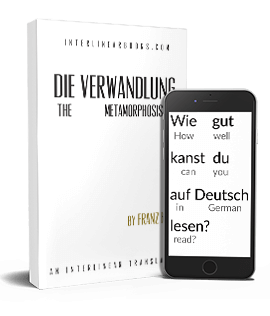 If you can read French you can read the original books here, and here. A student carnival. 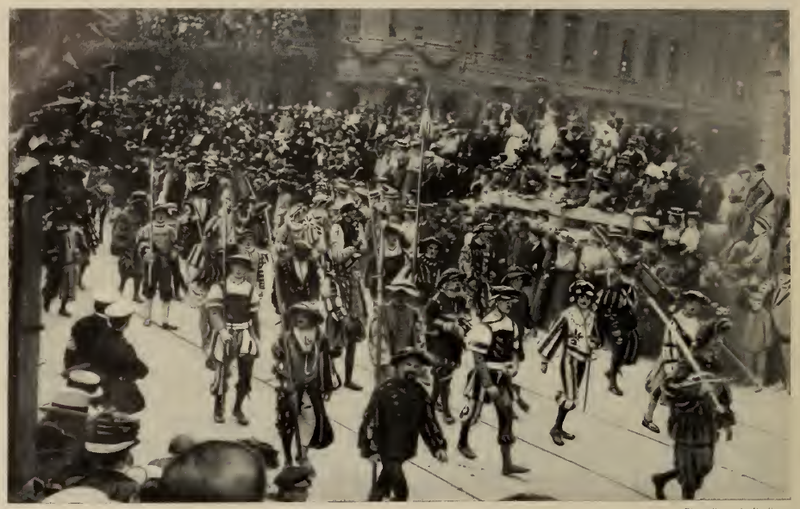 - It is in Leipzig that these festivals and carnivals are of greatest splendor and have the greatest impact. 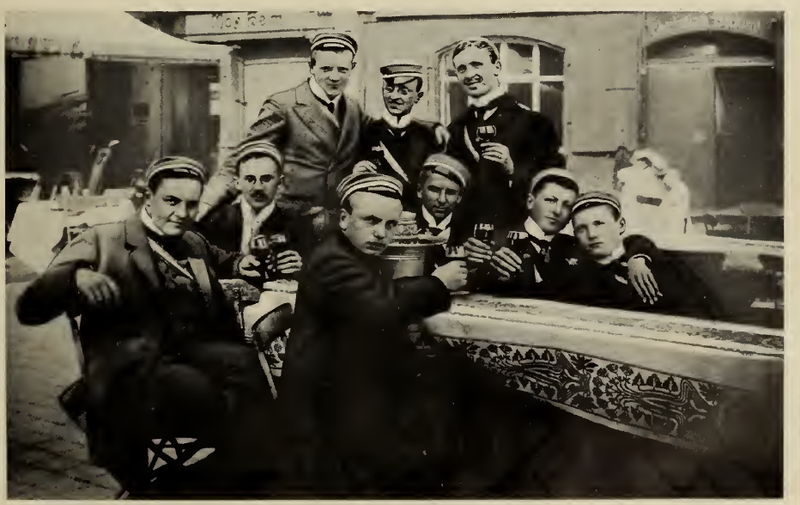 The Frühschoppen. 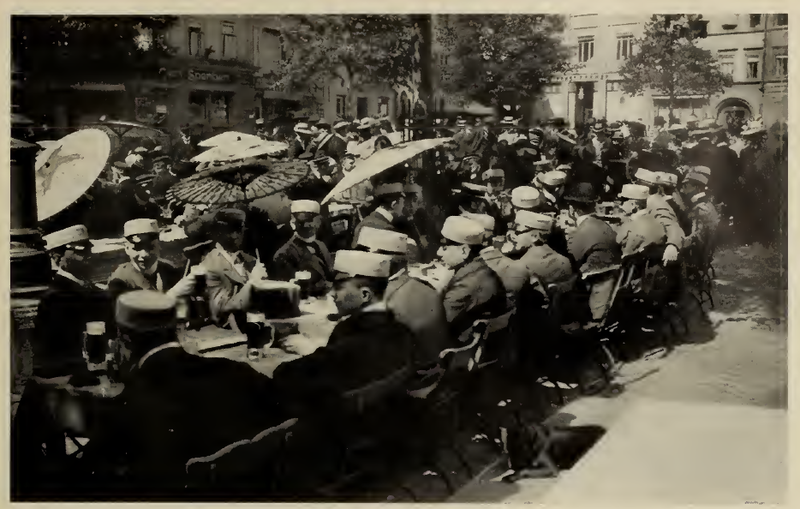 - Students in Jena will have a Frühschoppen on Sunday in the Marktplatz, a meal of sausages and beer partaken in Germany at around ten o'clock in the morning. Binge drinking. - Under the tables covered with an army of empty bottles, dozens of bottles are kept cool. 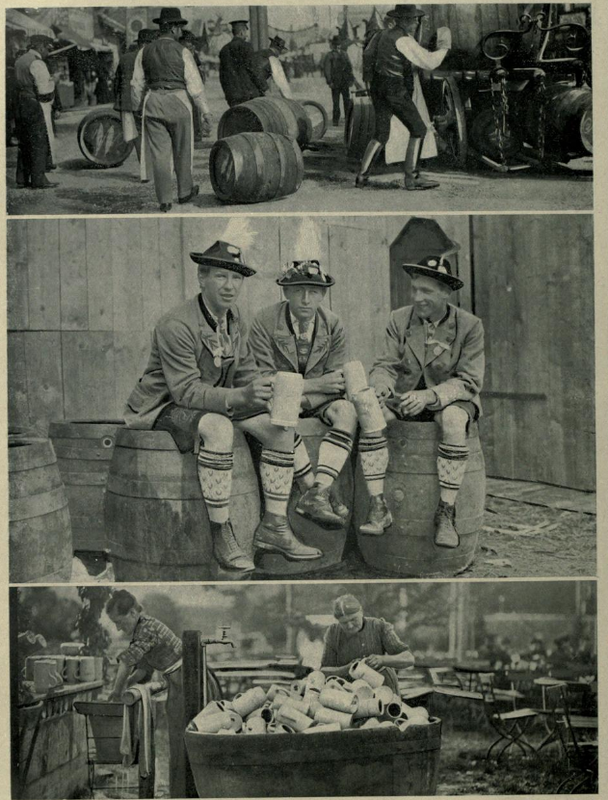 One student, charged with that duty, provides his comrades with full bottles. Beer baptism. - Among the fantastic events that new students are subjected to before being officially admitted to the corporations, one of the most characteristic is certainly the beer baptism. The seniors, perched on chairs and tables, dump the content of their glasses on the mats. A centenary. - An important festival should be celebrated with a special pageantry. Bremen. - Less favored by nature than Hamburg, Bremen carries out a magnificent struggle against its powerful neighbor, a living lesson for all commercial cities of the world. 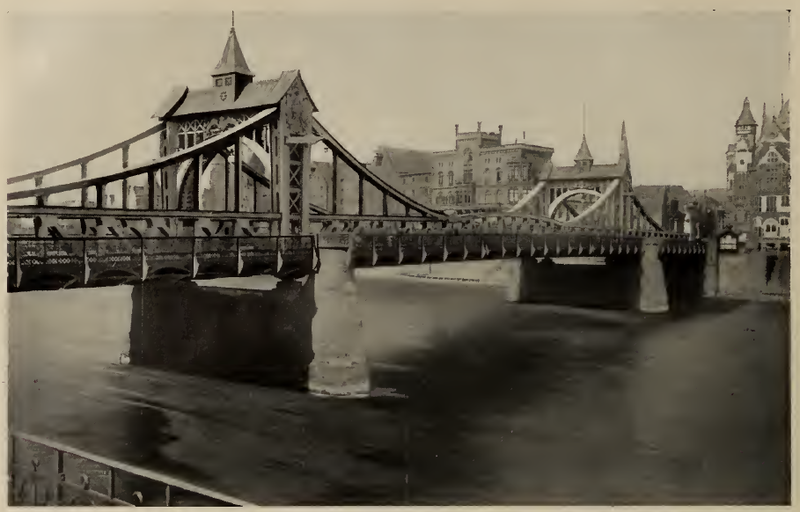 The Great Bridge of Bremen. - The Weser River it crosses had only two metres of depth 25 years ago.Today its depth is seven meters and tonnage on the river port has quintupled. 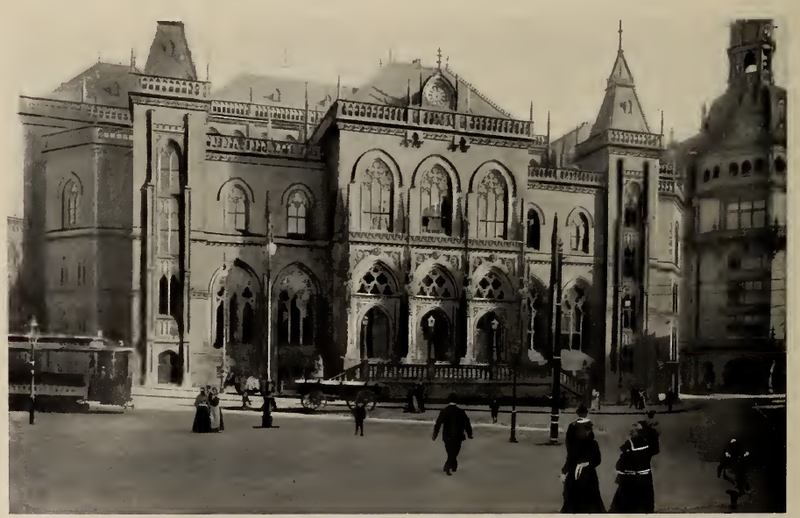 The Bremen stock market is a beautiful Gothic style building. The room is very impressive and richly decorated. 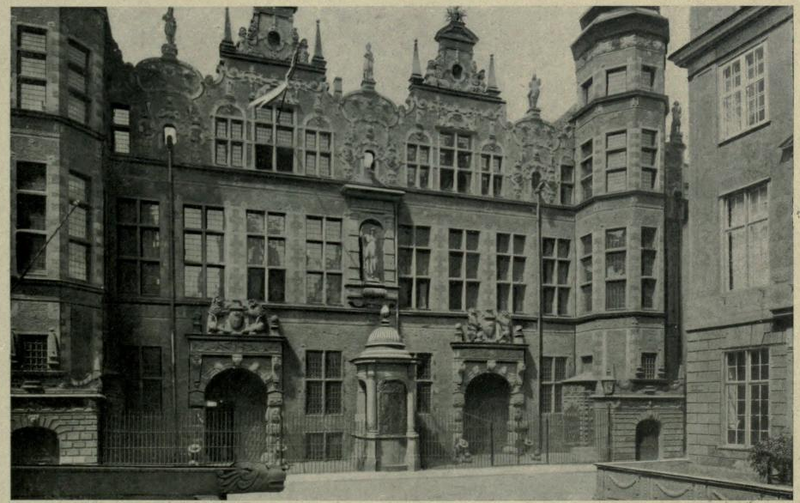 Bremen City Hall. - The large room, forty meters long, nine meters high, is one of the finest of its kind. 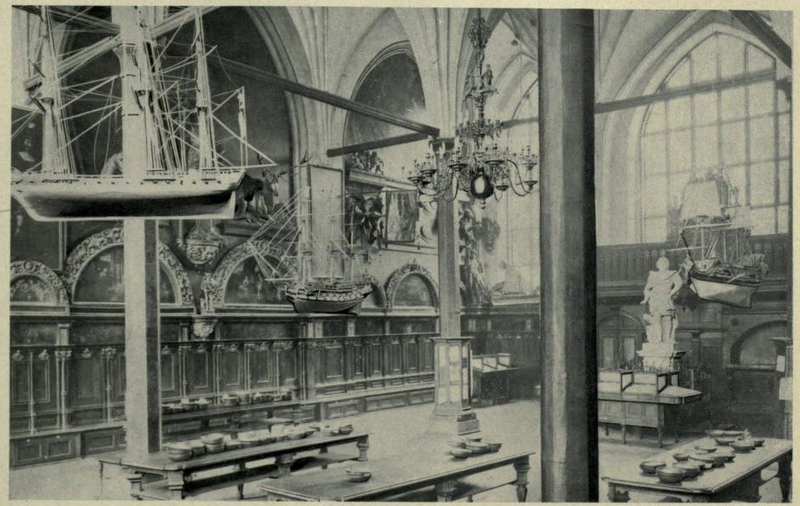 Its ceiling is decorated with models of ancient warships. Freeport Bremen contains the largest basin in Europe: 2300 meters long in a straight line. 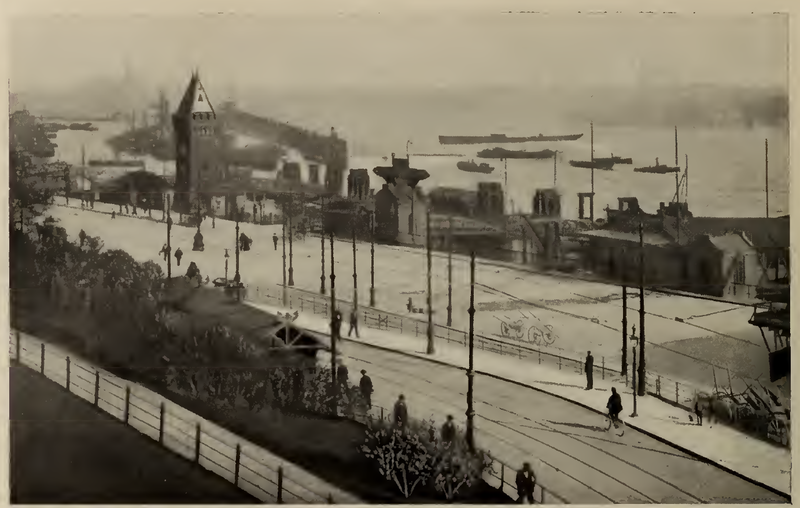 The quays are bordered with railroads with electric cranes every 30 or 40 meters. 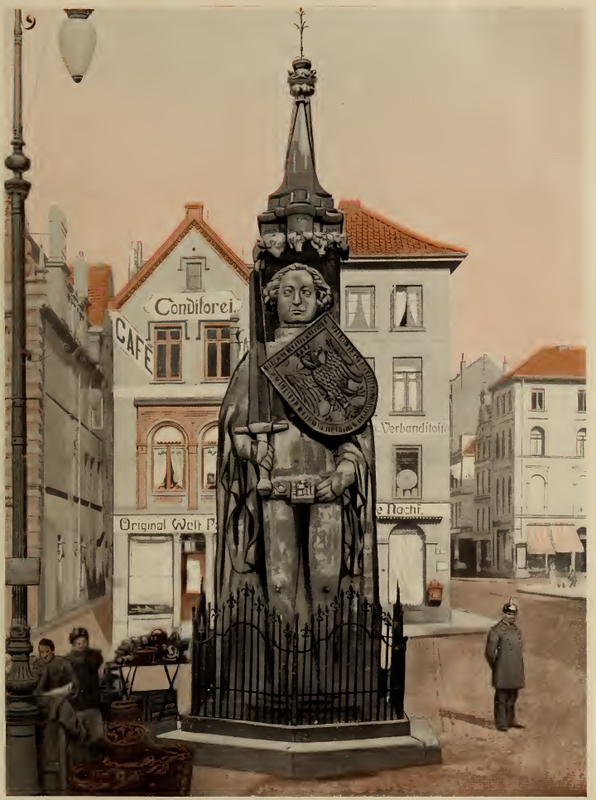 The statue of Roland, the defender of municipal liberties, was erected in 1412; it remains as a symbol of the rights and privileges of the city of Bremen. The Burgerpark, planted from scratch in swampy grasslands, is now a beautiful forest with the largest variety of species. 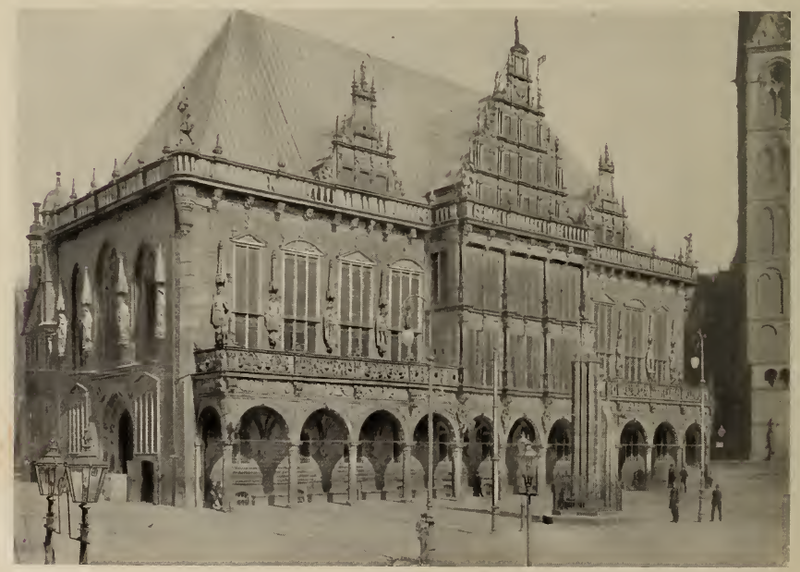 Bremen City Hall. 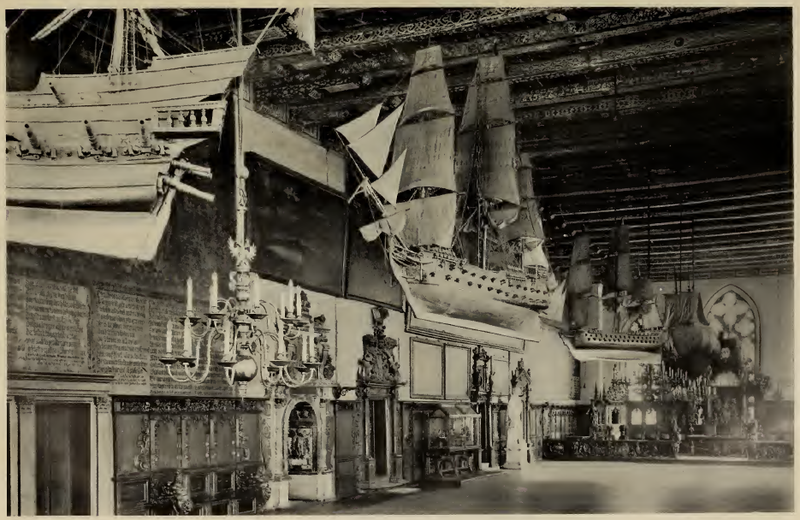 - Its main structure dates back to the early fifteenth century along with the sixteen statues, including the emperor and the seven electors, backed by piers on the first floor. 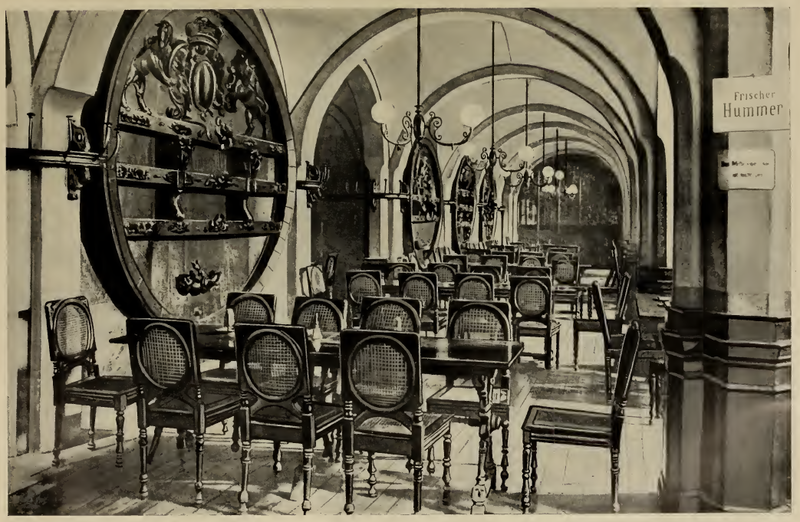 The Ratskeller (basement of the Town Hall) of Bremen is famous throughout Germany, certainly for its age because it dates from the fifteenth century, and also by the quality of its wines. 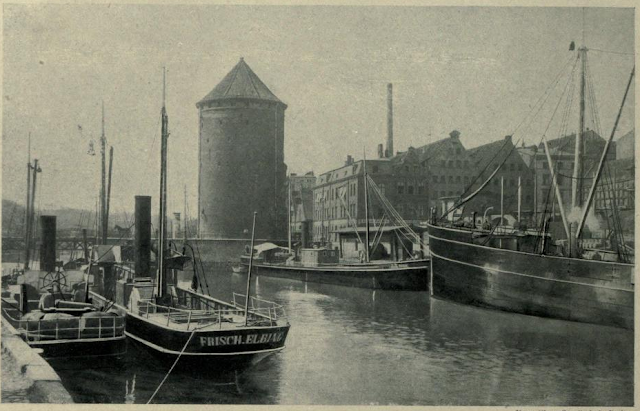 The Hotel of Norddeutscher Lloyd of stands in the center of the city, a large and massive construction of bluish stone dominated by a tower 75 metres in height. 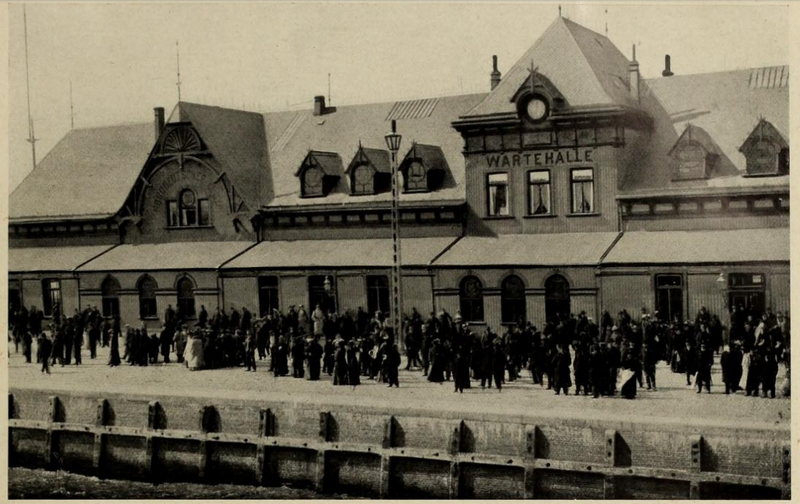 Waiting hall. 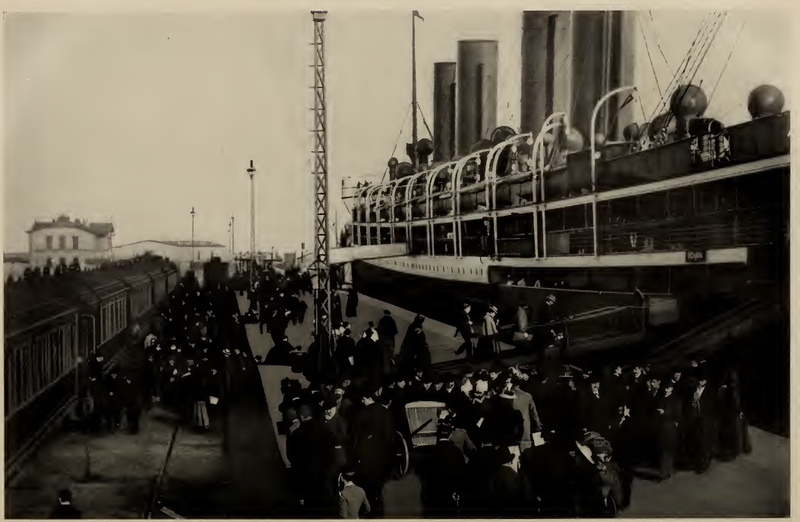 - The slow and majestic entry of a powerful steamer, assisted by its tugs, is an imposing spectacle that attracts a crowd of onlookers. 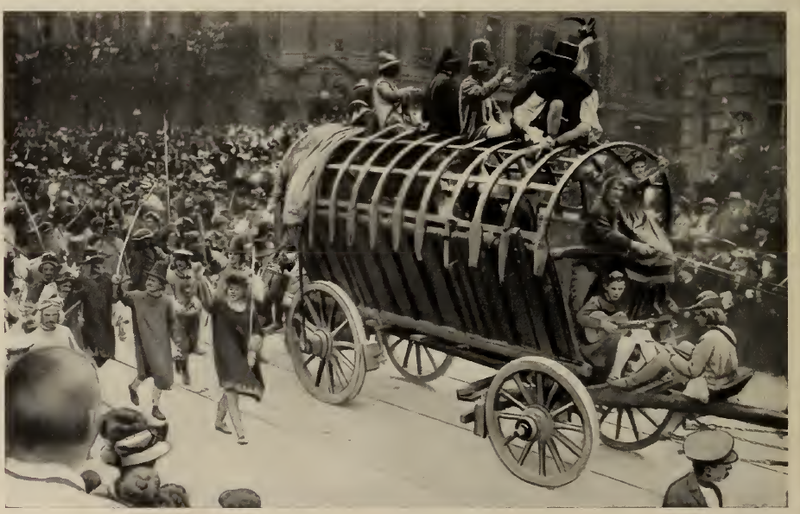 The baggage of steerage passengers. - These passengers are often immigrants. The "Norddeutscher Lloyd" is a huge and powerful company, one of the main providers of the prosperity of Germany and its influence around the world. It has 34 shipping lines, affecting North America, South America, Asia, Australia, the islands of Oceania. Its ships carry an average of 600,000 passengers annually. 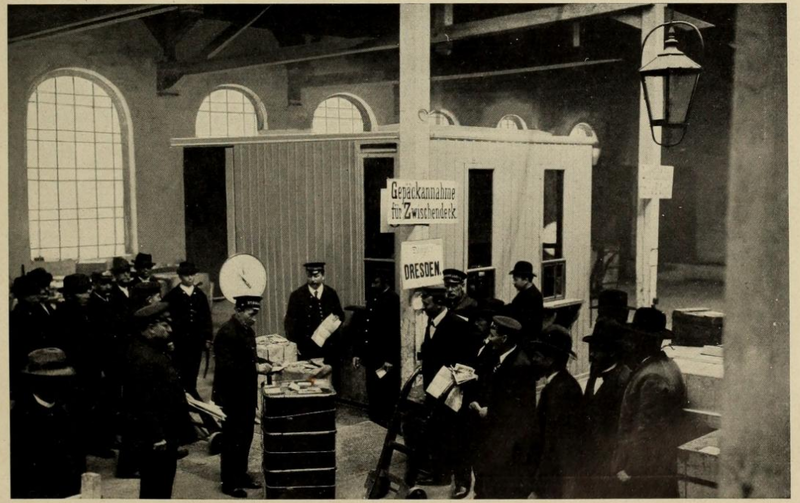 Boarding of cabin passengers. - The train "Lloyd Special" has just stopped. The cabin passengers descend and climb the bridge. The boarding orchestra is then heard to greet them. Lifeboat operations. - An exercise to ensure and protect the safety of passengers. 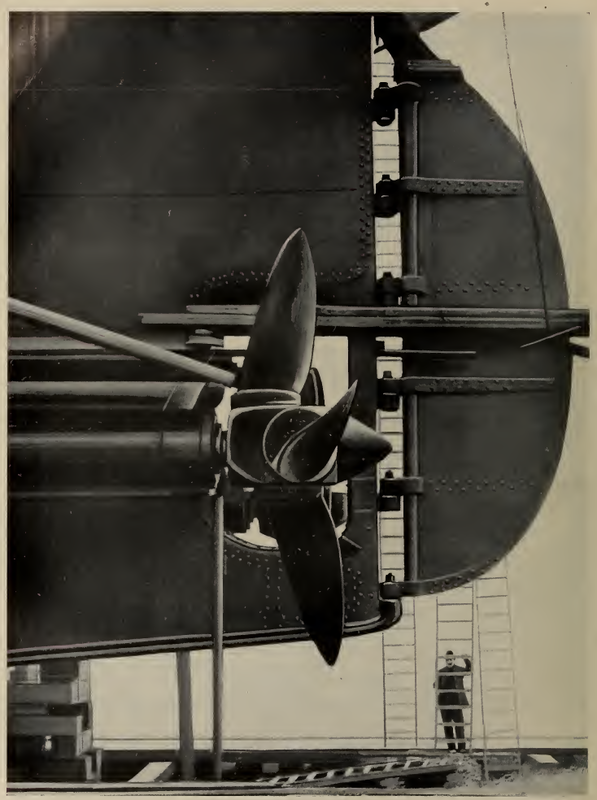 The propeller of a steamer. - The propellers of the "Kronprinzessin Cecilie" measure about 14 meters in diameter and have a respectable weight of 36,000 kg. 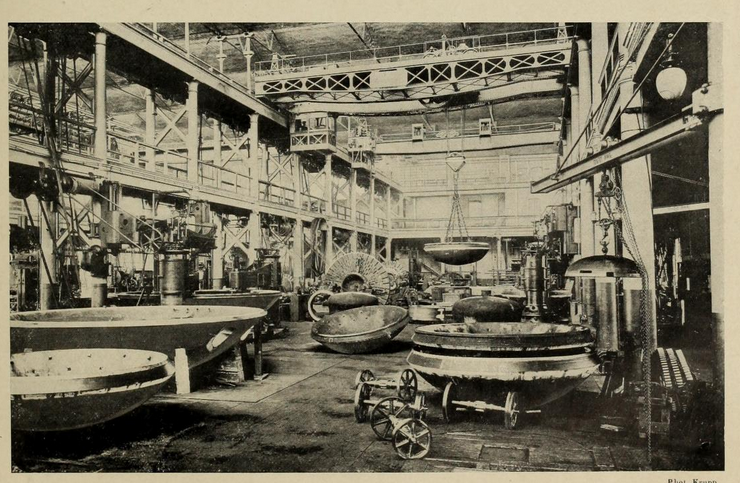 The experimental basin. - In this basin paraffin models are in turn placed in the water and weighted down to the required depth. 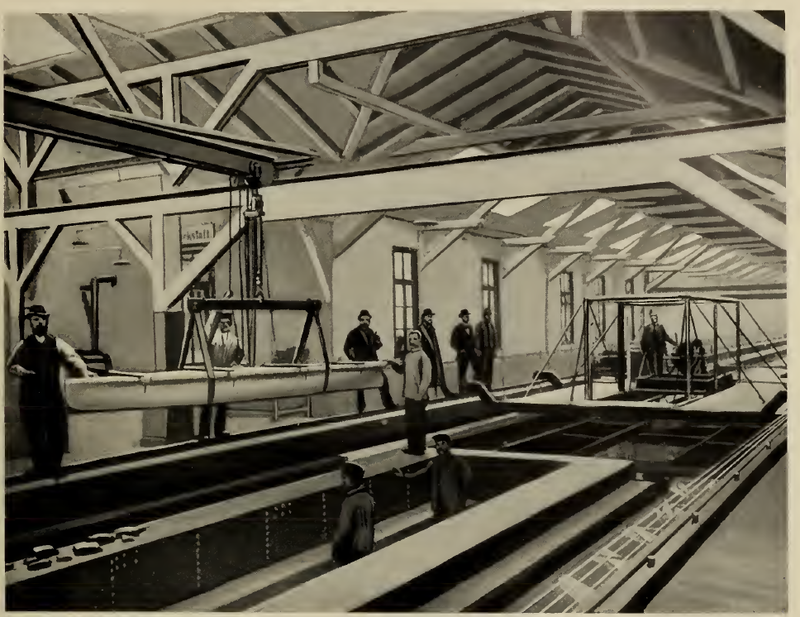 The train rolling on rails above the water surface carries with it the model, uses the apparatus for which it is provided, records the resistance, the speeds and the differences by immersion. 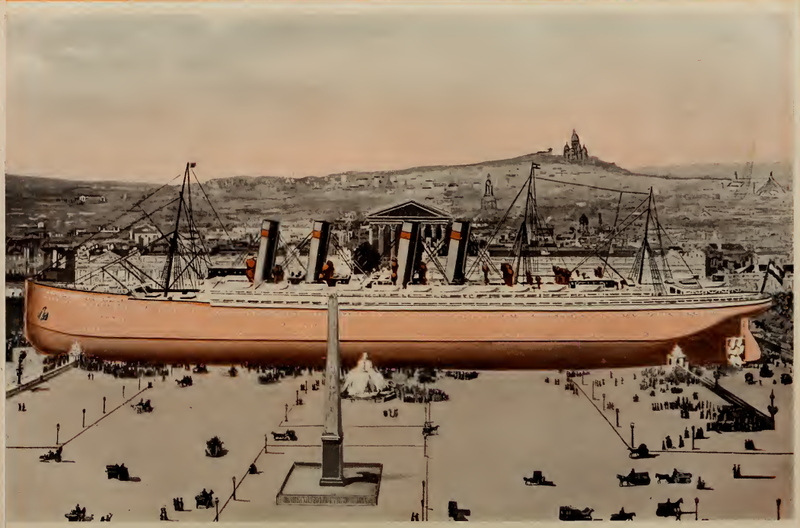 The "Kronprinzessin Cecille" measures 215 meters long and 21 meters wide and has a displacement of 28,000 tons: its strength is 46,000 horsepower. 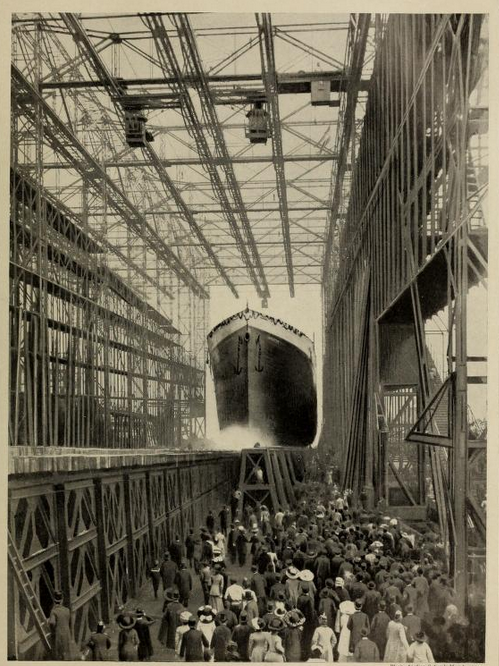 At present, the "Norddeutscher Lloyd" has under construction the "Columbus" which will exceed 35,000 tons. 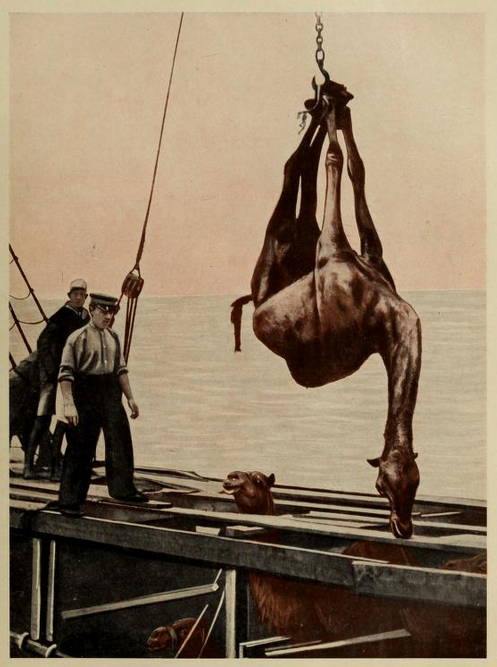 The yacht "Walküre". 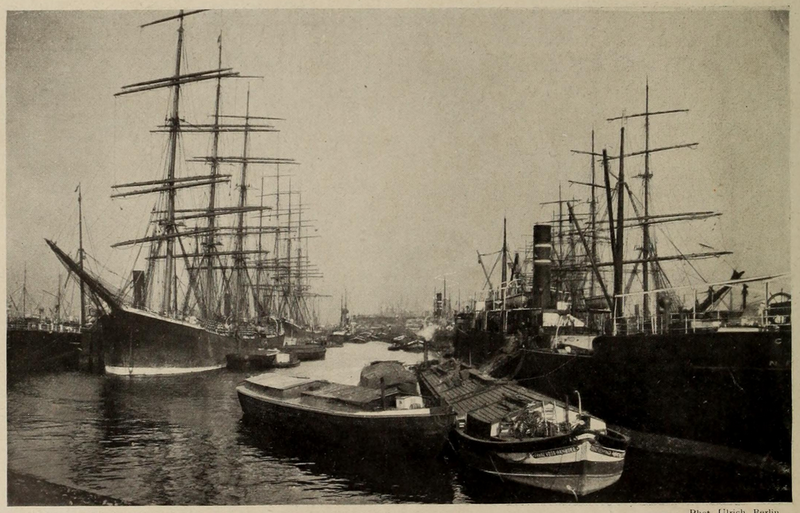 - The Hamburg maritime fleet includes 1,320 ships with a total tonnage of nearly two million tonnes, a large part of which comes from sailboats. Hamburg. 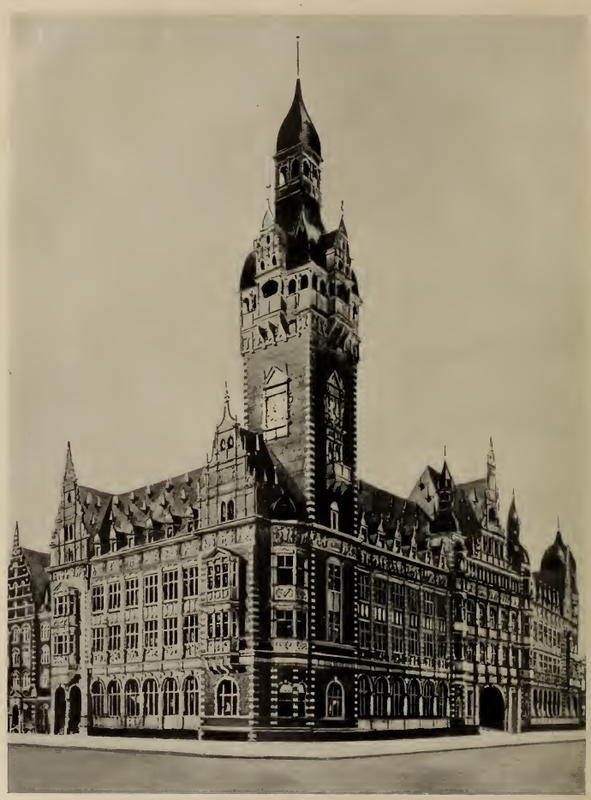 - The Rathaus, rebuilt some ten years ago, is a fine edifice of stone, surmounted by a tower of 112 meters, harmonious in its heaviness. The Fleth District. 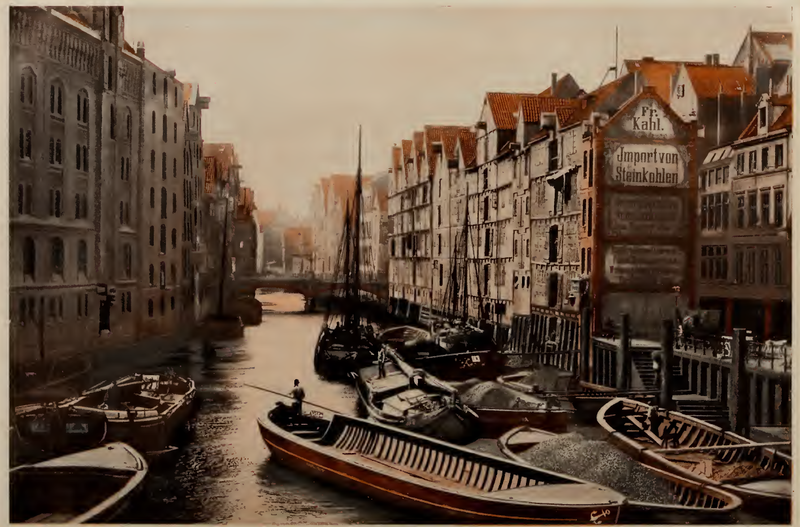 - The term "Fleth" the many canals that criss-cross the old city. Two rivers here are connected through sluices. 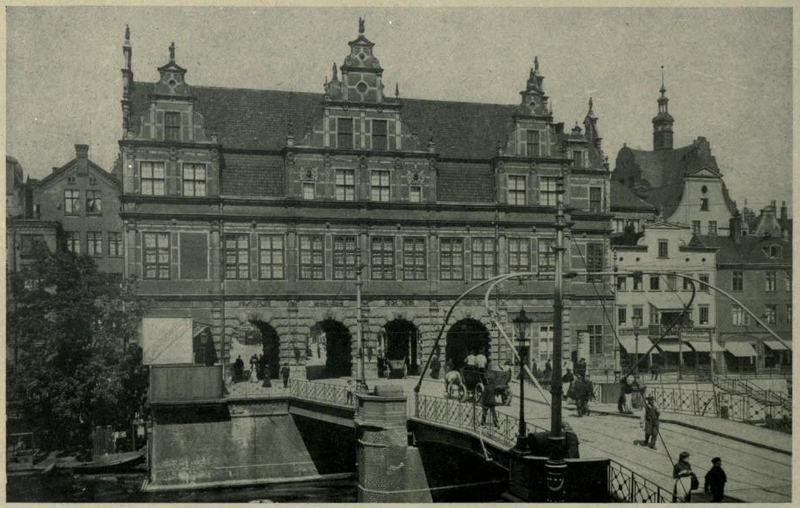 Hamburg. - The Alster-Flag is a cafe-restaurant built on stilts, one of the most frequented in the city. Beside it are the Hamburgerhof and superb hotel Vierjahreszeiten. 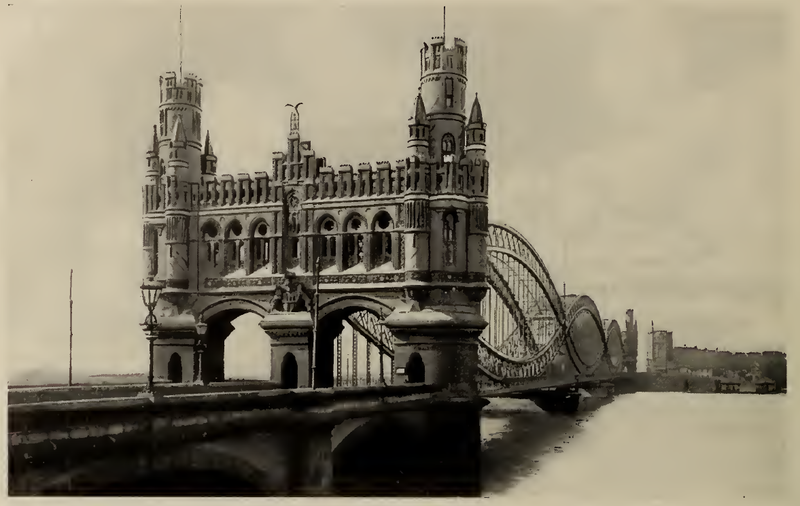 The Bridge of the River Elbe was completed in 1888. At its ends rise large brick Gothic gates, which give it an imposing and monumental character. 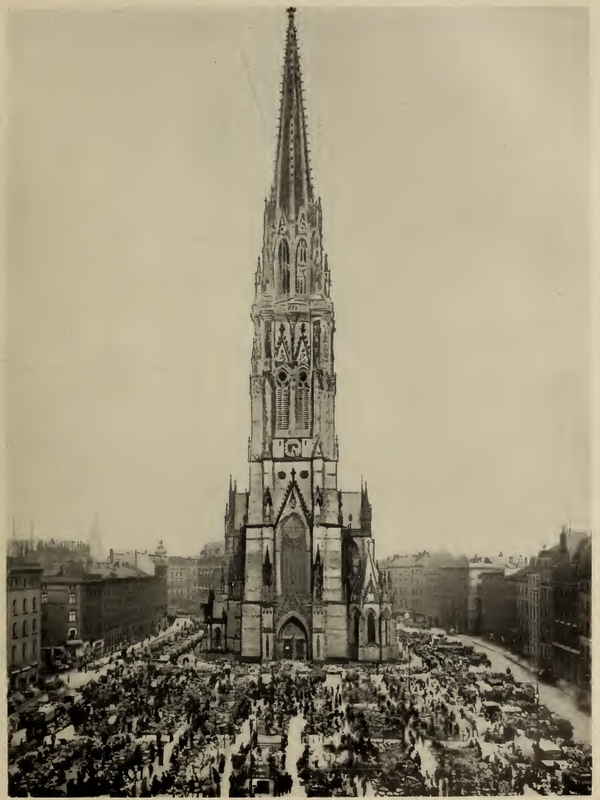 The Commemorative Monument of 1870-1871. 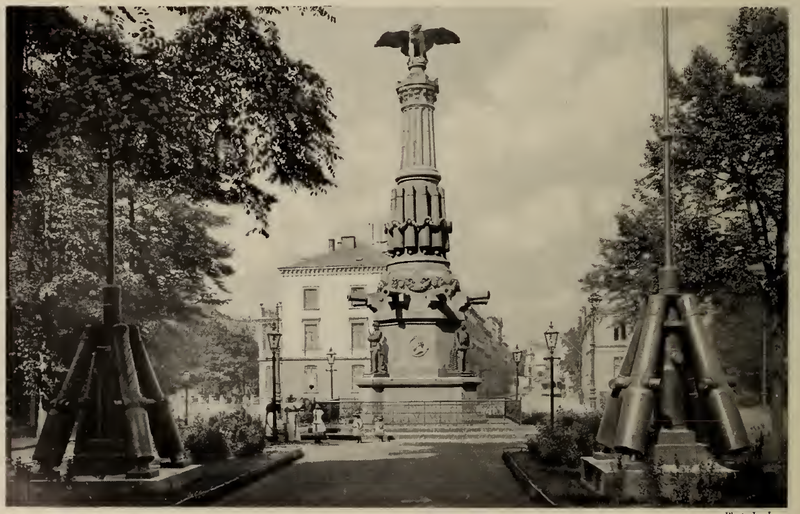 - Its breadth and its banality give a fairly accurate idea of most German patriotic monuments. 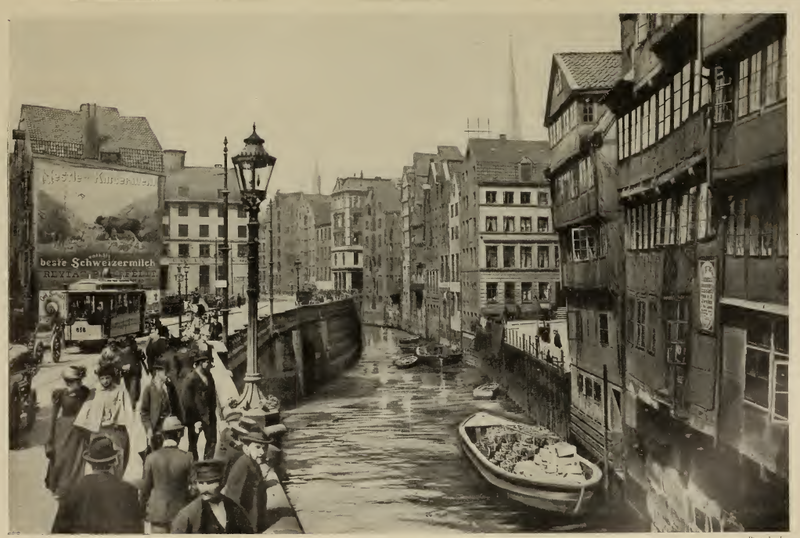 The Diemurser Bridge belongs to this picturesque old quarter of Hamburg through which small barges travel on the dirty water amongst the boats moored here and there. 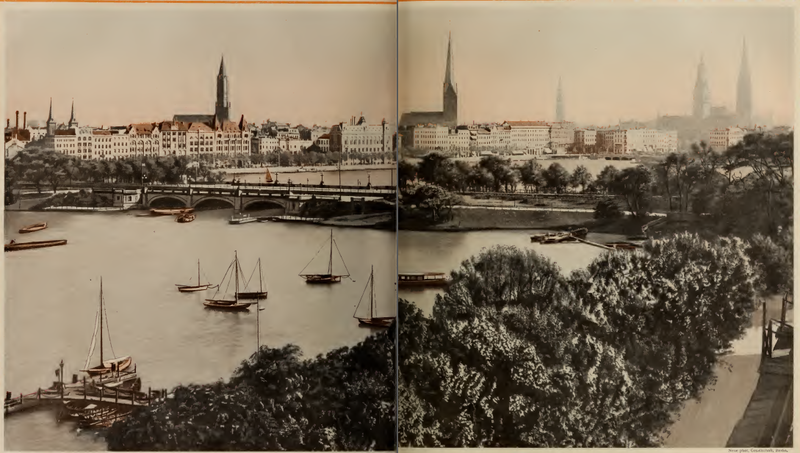 View of the Alster. 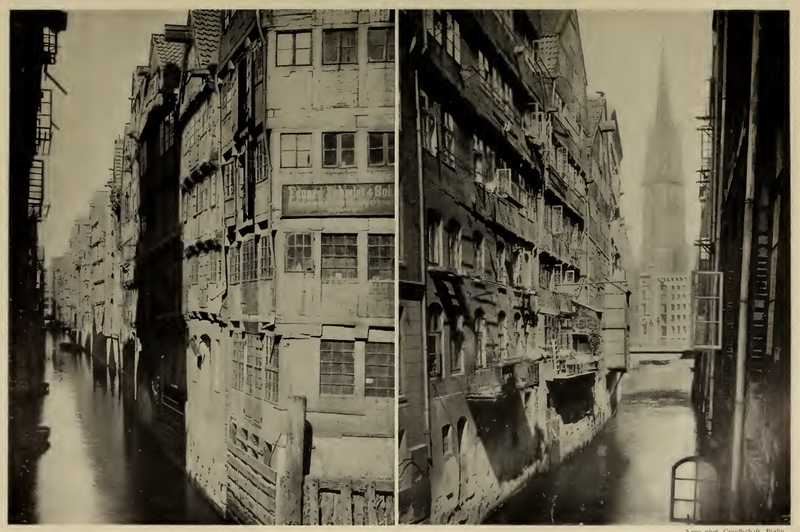 - The Alster is divided into two parts by the bridge of the Lombards. 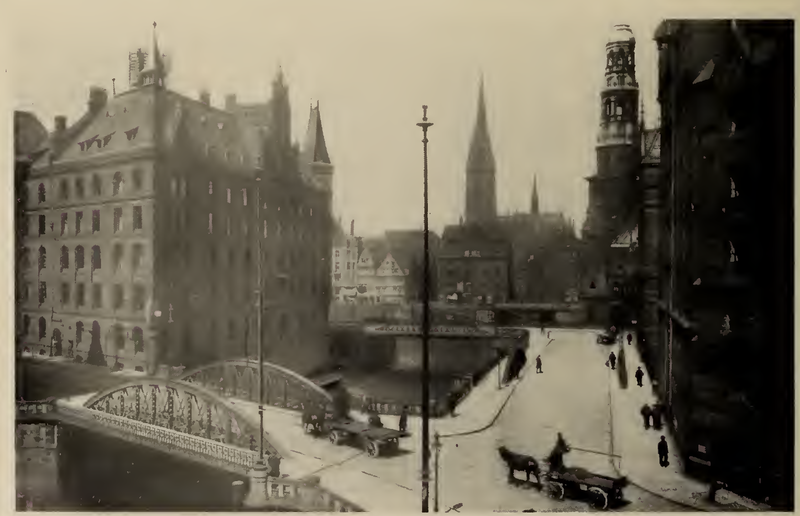 In the foreground, the Aussen-Alster, further, the Binnen-Alster. The brightest and most beautiful part of the city is the Binnen-Alster. On its banks, especially on the Jungfernstieg, walks an elegant and cosmopolitan crowd. 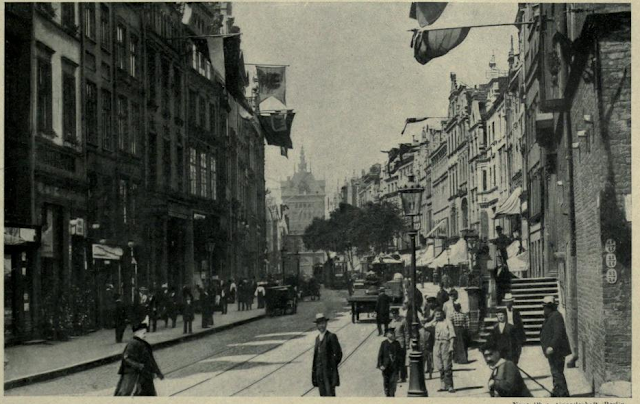 The Elbstrasse is one of the busiest shopping streets in Hamburg. Here one is aware of the movement of business of one of the most important ports in the world. 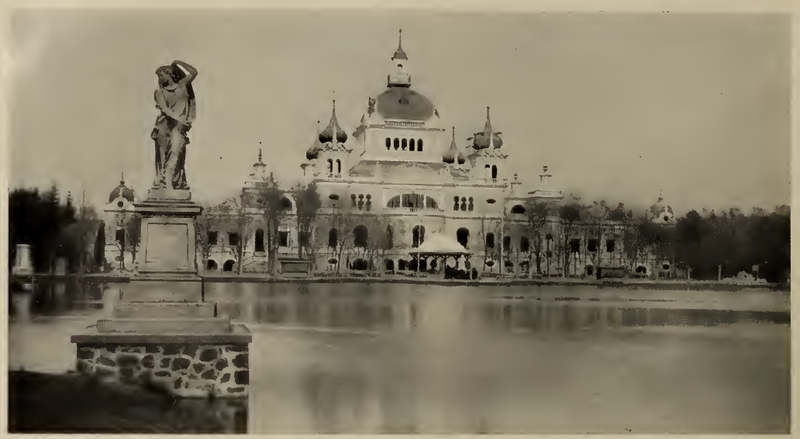 The swimming pond. 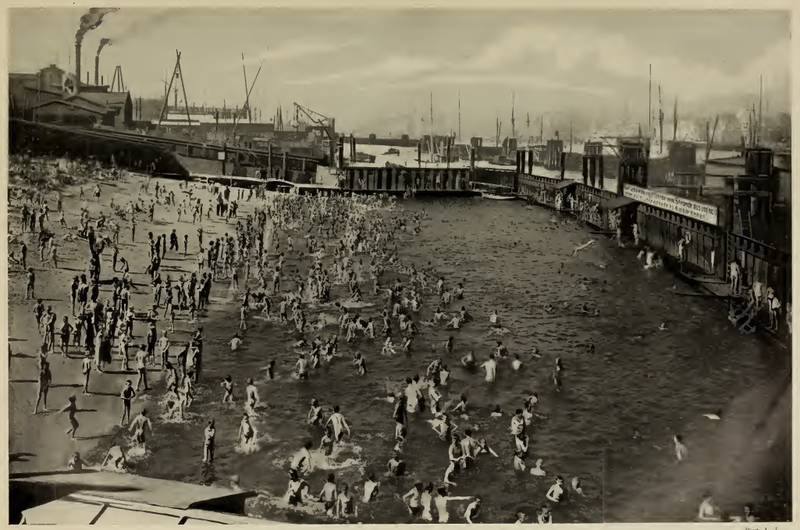 - Amid the intense animation of many ponds that constitute the great port of Hamburg, the incessant movement of steamers, boats and yachts, it is a curious sight to see the antics of the many swimmers in the frothing Elbe. 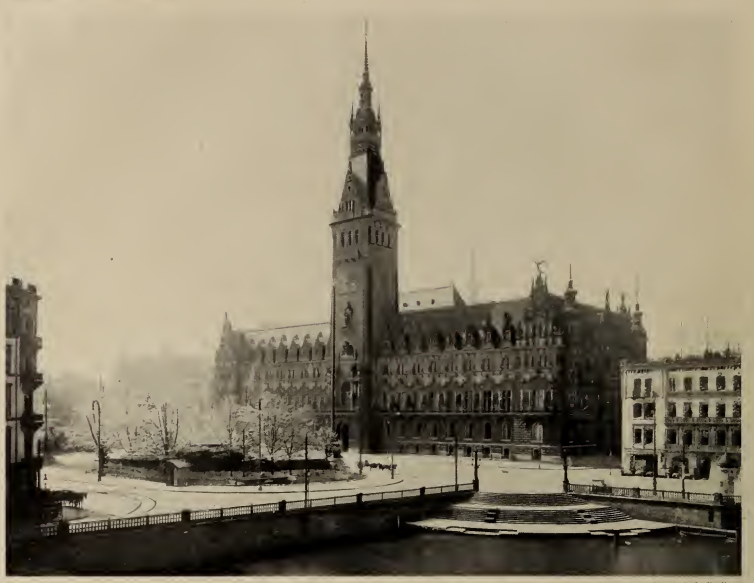 Hamburg. 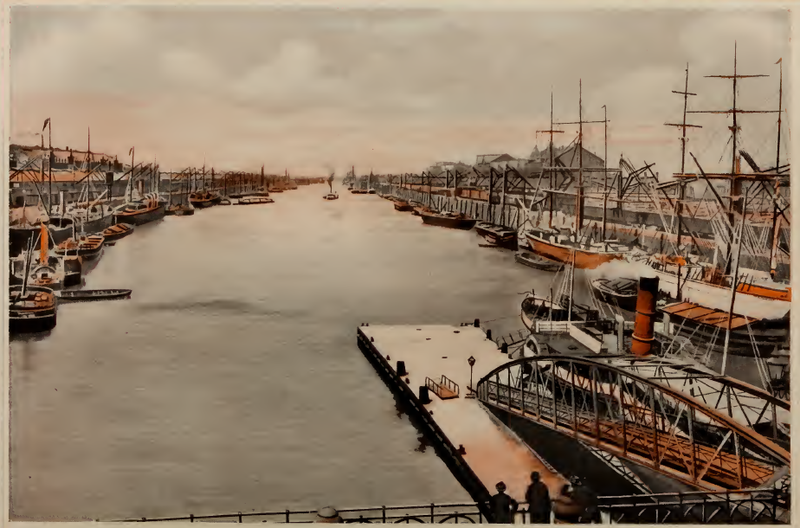 - Perpendicular to the docks covered with warehouses, cranes, trucks, railways, etc., one sees narrow streets interspersed with canals with muddy water. This is the area of the "Fleth." Part of Freeport. - Vessels approaching Freeport and can leave at any hour of the day or night, without customs control and without hindrance of any kind. 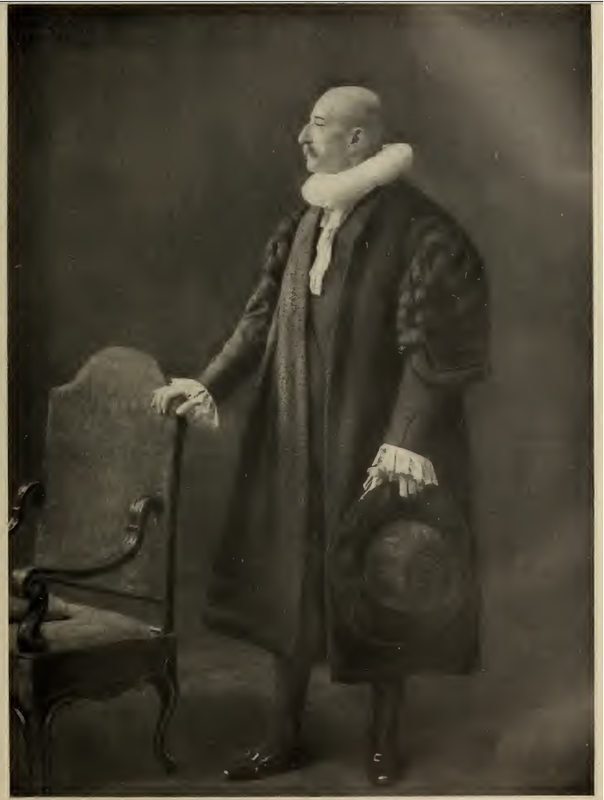 Henri Bruchard was for a long time the mayor of Hamburg and President of the Senate. For fifteen years, he remained one of most prominent politicians of the great city. 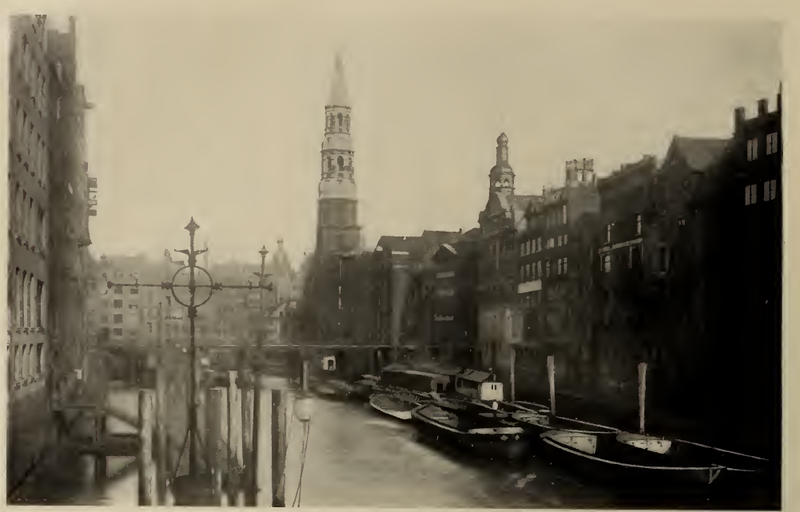 The Canals. - Old houses with gables and small windows opening to the outside border warehouses, shops, brick and wood residences. 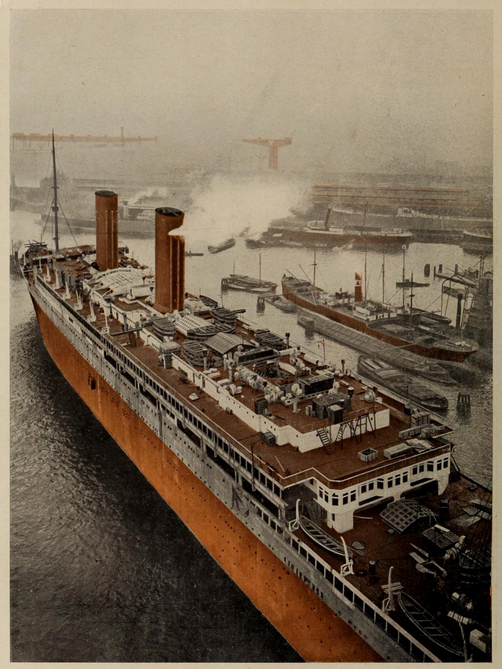 The Imperator, which belongs to the Hamburg-Amerika Linie, is at present the largest transatlantic with a caliber of 50,000 tons. The San Pauli quarter. 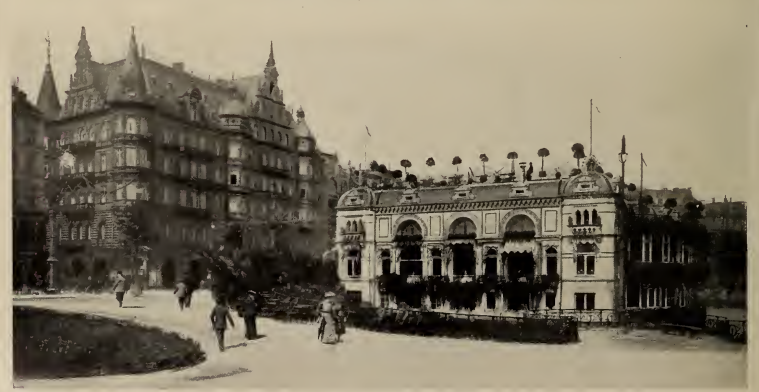 - This suburb of Hamburg is the theater of marine life. They make their way around from tavern to tavern there. 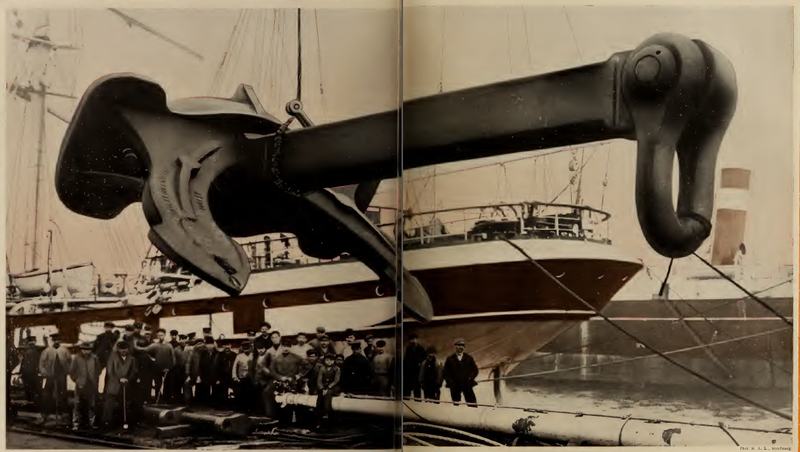 The main anchor of the Imperator, by its enormous size, gives an idea of the mass that the boat itself represents. It is indeed 285 metres in length and 30 metres in width. Four turbines give it 62,000 horsepower, and a speed of 22.5 knots. On this floating city they have established a restaurant, a grill room, a tea garden, a superb ballroom, and even a swimming pool. 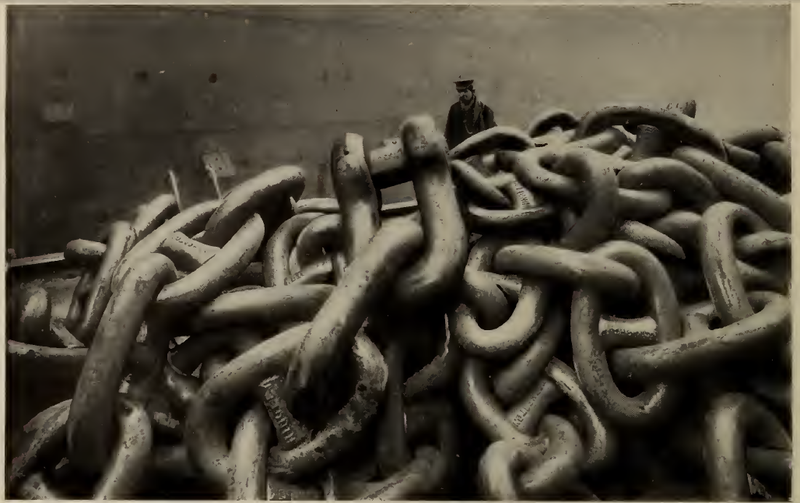 The anchor chain of the Imperator, where each ring seems to almost reach the height of a man, is the largest that has ever been made. 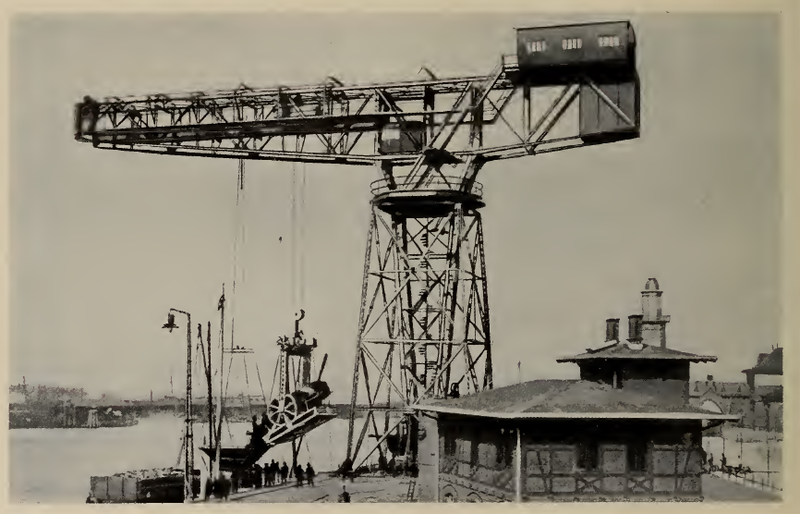 The landing of goods from the Imperator is done quickly thanks to the simultaneous use of many cranes. 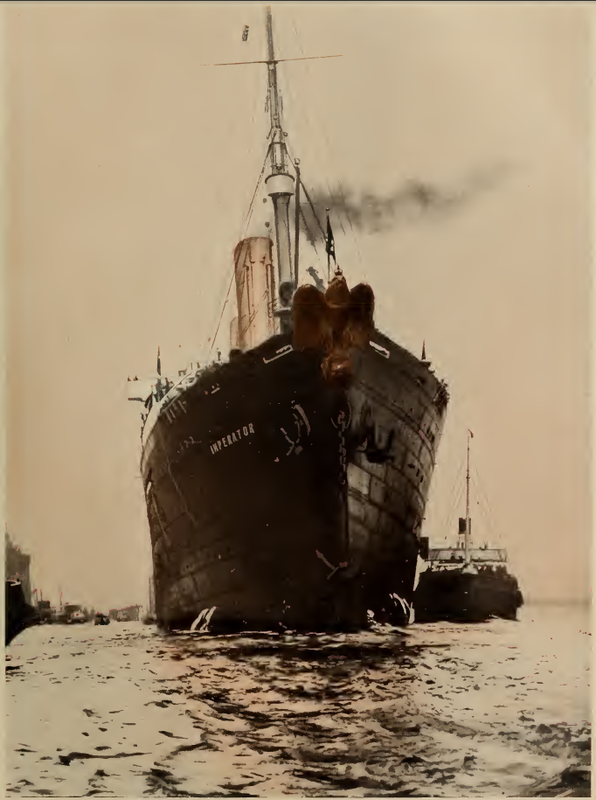 The coal supply of a transatlantic. -- There are thousands of tons that must be buried in the hold, since the machines devour more than a thousand of them a day. 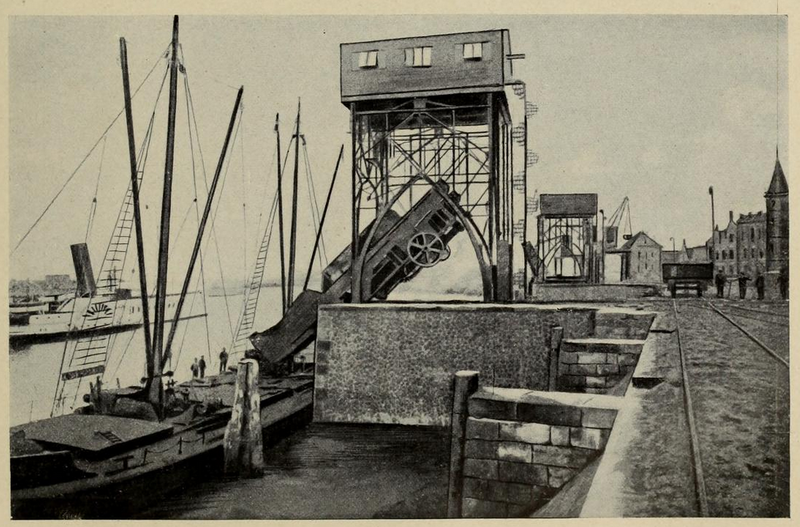 Hamburg - The unloading of charcoal. -- This operation will soon only be done automatically, just as it is done in America. 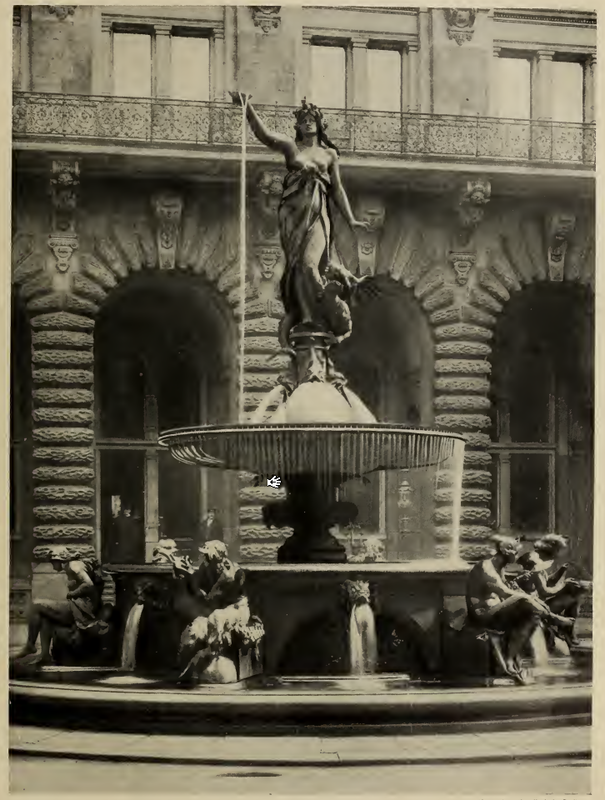 Hamburg -- The bronze fountain that stands in the middle of the Rathaus courtyard, is of a rather original and pretty character. Hagenbeck's Menagerie: Some of the turtles can be sold for quite a sum, those such as flat turtles and alligator turtles. The testuda geometrica is worth up to 30 francs. 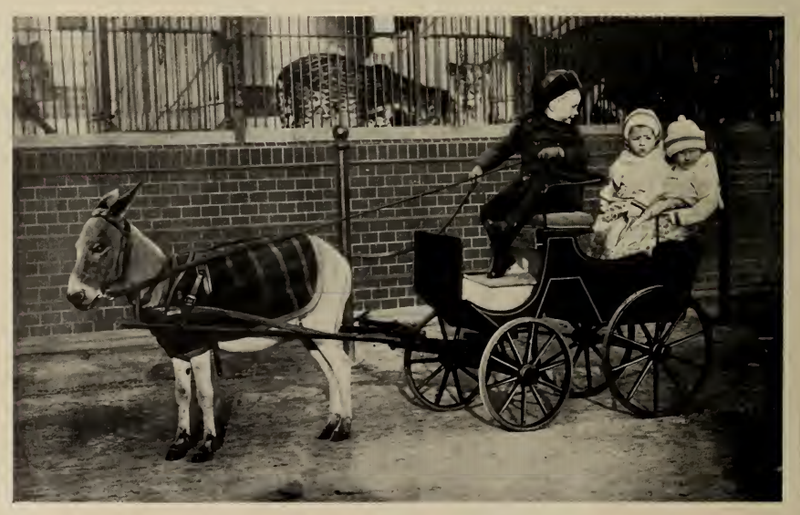 Hagenbeck's Menagerie: The bottle-feeding of lion cubs. 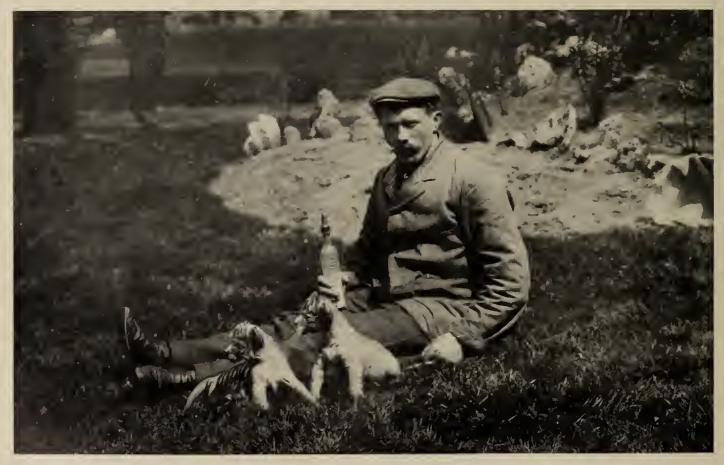 -- Mr. Hagenbeck has had goats that have nourished tigers, and female tigers that nourish dogs. 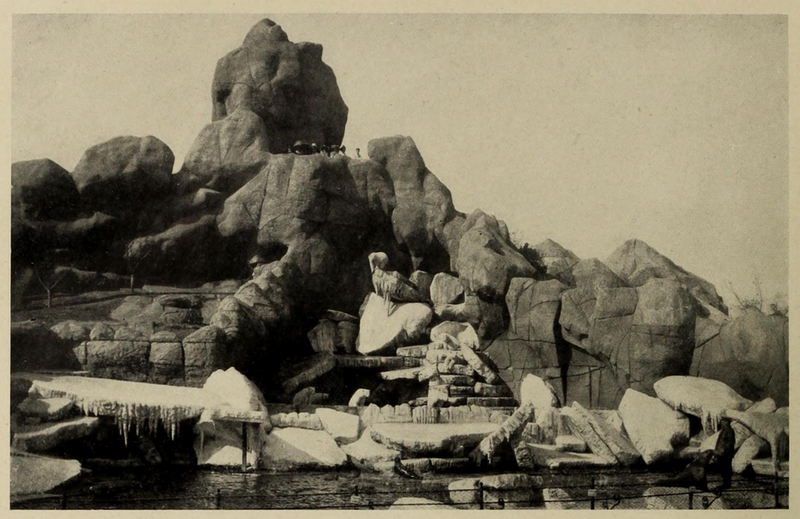 Hagenbeck's Earthly Paradise is a set of gardens, ponds, rocks and mountains where his fierce animals roam free. 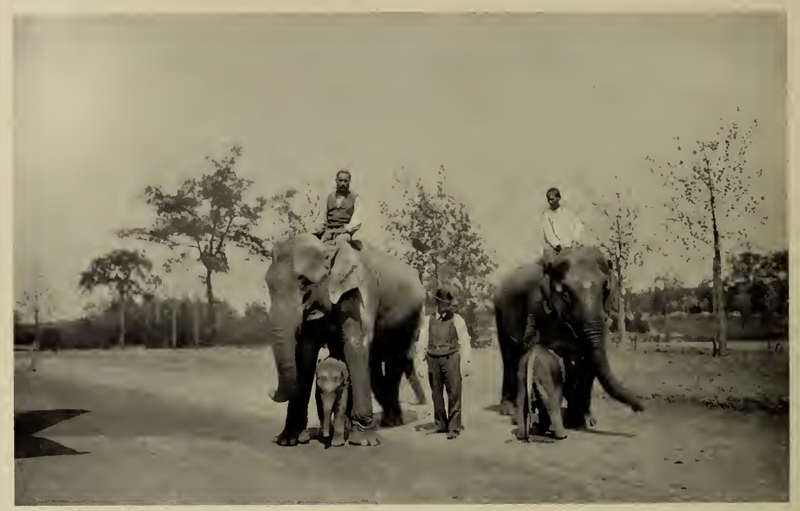 Hagenbeck's menagerie: under the leadership of the drivers the elephans walks, stop from time to time to swallow the sand of the walkways. 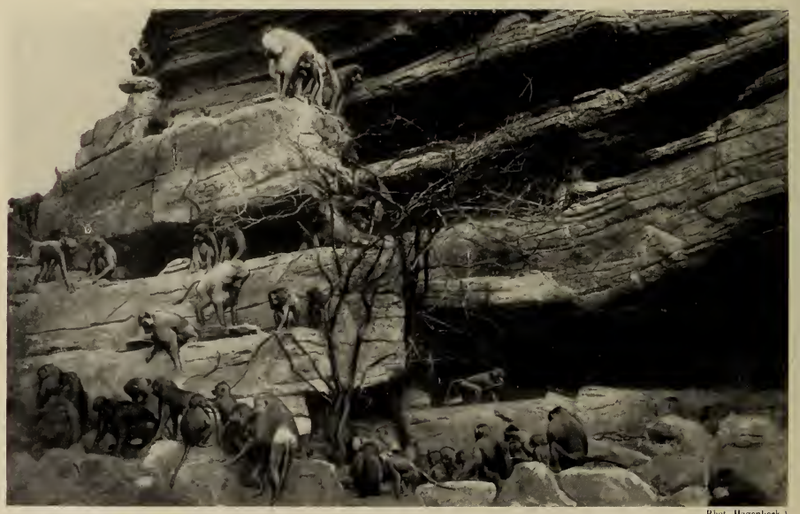 Crawling along the rocks, always busy, is a crowd of the most diverse monkeys: baboons, hamadryas, macaques, mandrills, mangabees, etc. The sea lions are among the most intelligent animals. Along with the walrus they are the easiest marine mammals to train. 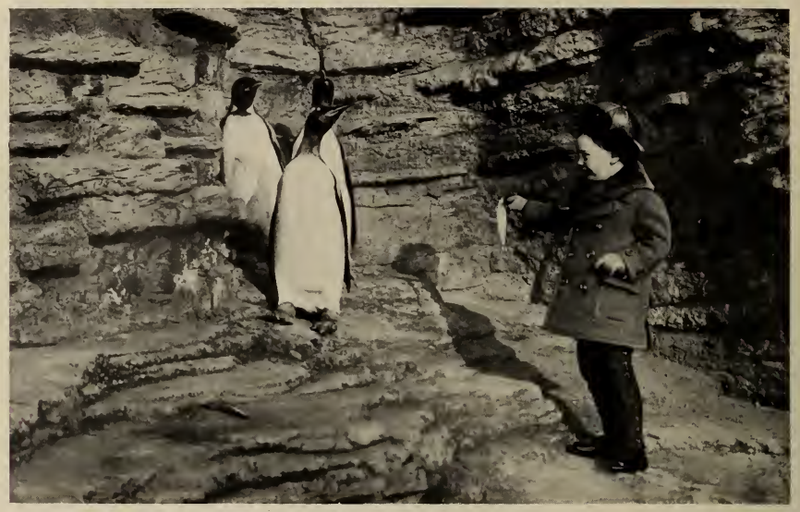 Hagenbeck's menagerie also sells penguins with prices reaching 200 and 375 francs depending on species. The little animal that drags this tiny cart is very rare, belonging to a race of donkeys living in the Himalayan Mountains. The Himalayan donkey does not reach the size of those in our country, but it has a more distinguished, almost graceful form. Llamas -- a pair of llamas around three years old sells for 1,000 francs. The seals cost relatively less. 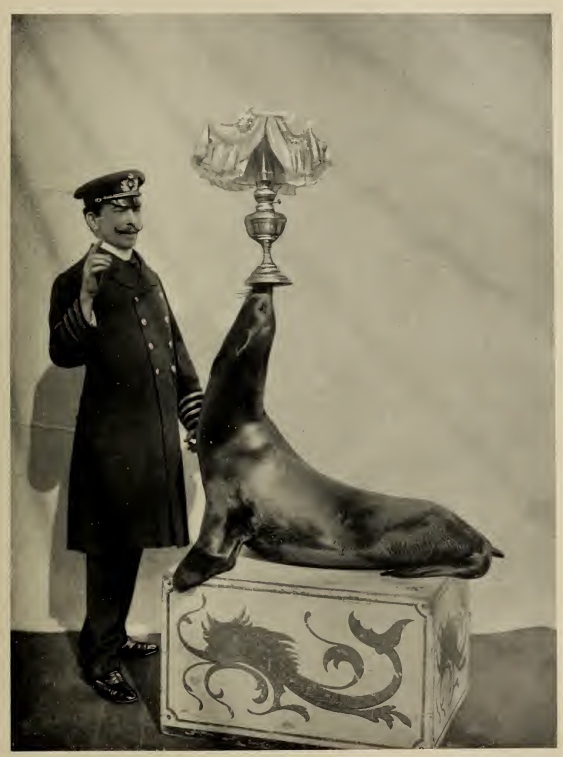 One can get a seal of enormous size for 400 francs. 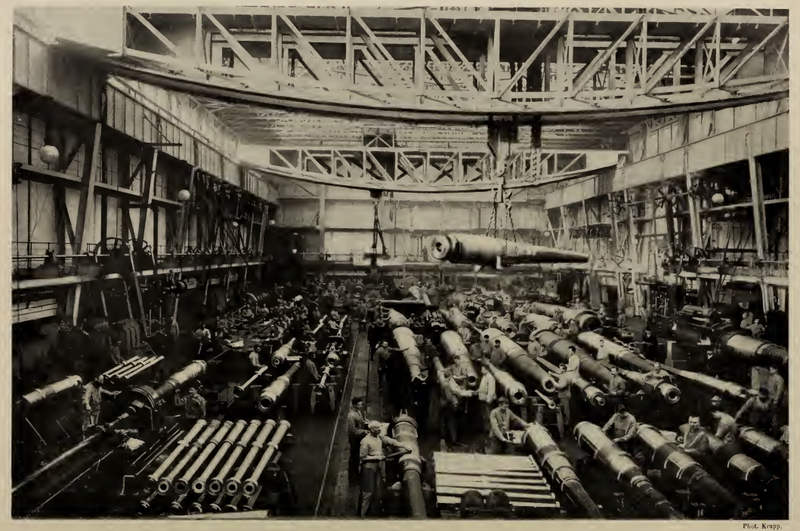 Krupp manufactures much of the armour plates used in the German navy. 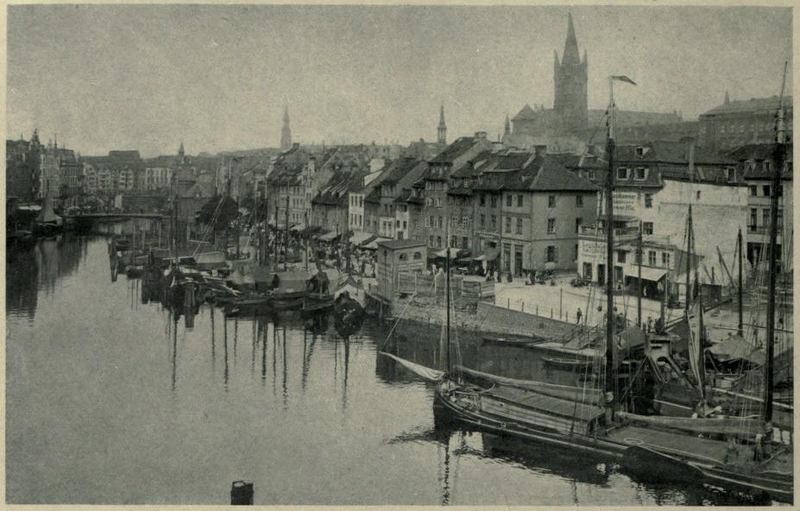 Kiel is the largest military port in the Baltic. It's the only part on the coast where nature has provided a natural deep water shelter for large vessels. Krupp. -- An armored double turret in a state of completion. At the top, slightly above the roof of the turret, is the armored cupola where those who fire it are posted. Krupp. -- A 15 cm side cannon, 7.5 metres in length. It is mounted on an eclipse lookout. On the left we see test projectiles. Left: effect of a 255 mm breaking shell, charged with 31 kg of picric acid. 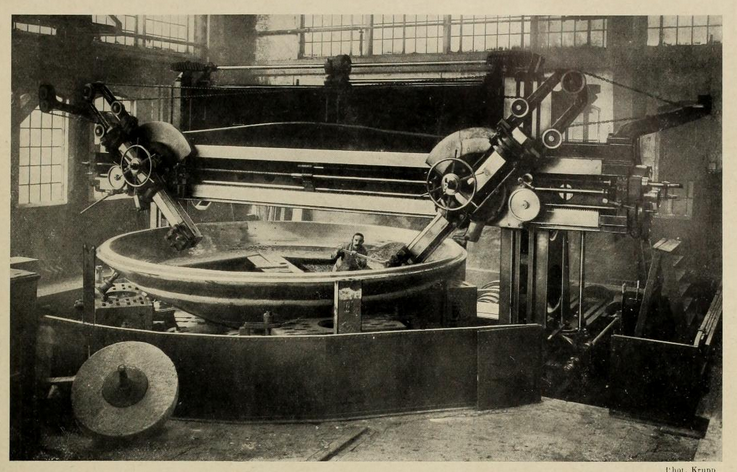 Centre: Nickel-steel cap serving as an object of study. Right: Hardened nickel-steel plate used for the experiments. Krupp. -- A 28 cm edge cannon. 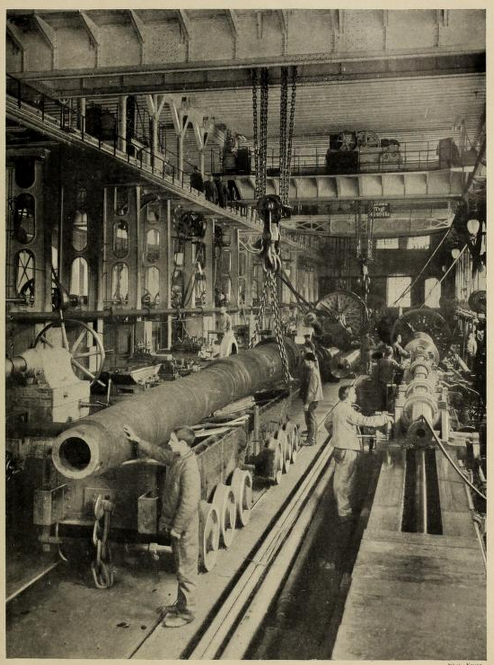 This gun, intended to be placed in a turret, is provisionally installed in a battery for development and adjustment. It is 11.2 metres in length. Krupp. -- Laminating a shield plate. 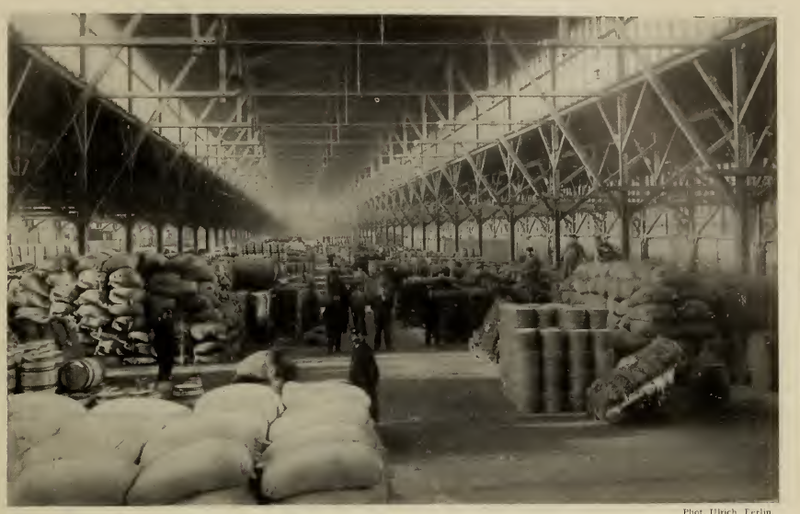 Once poured, th eplate is sent to the mill. With the mobile cylinders upon which it slides it is easy for the workers to move it with all the precision ordered by the team leader. Dreadnought. 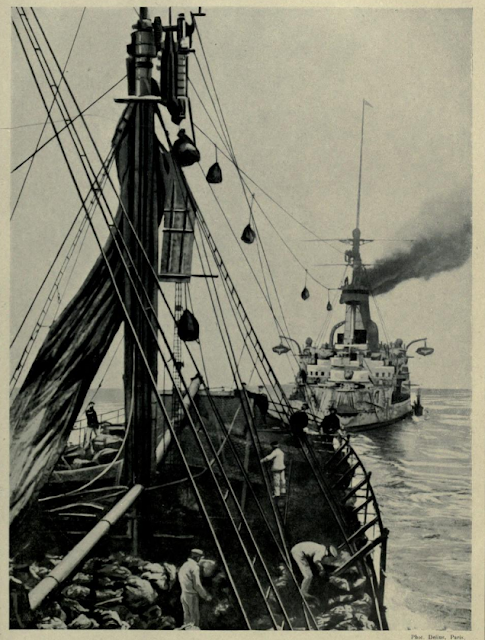 -- The Nassau class belongs to one of two squadrons of dreadnoughts: the first Nassau dates to 1908, and in just five years Germany will possess sixteen dreadnoughts. 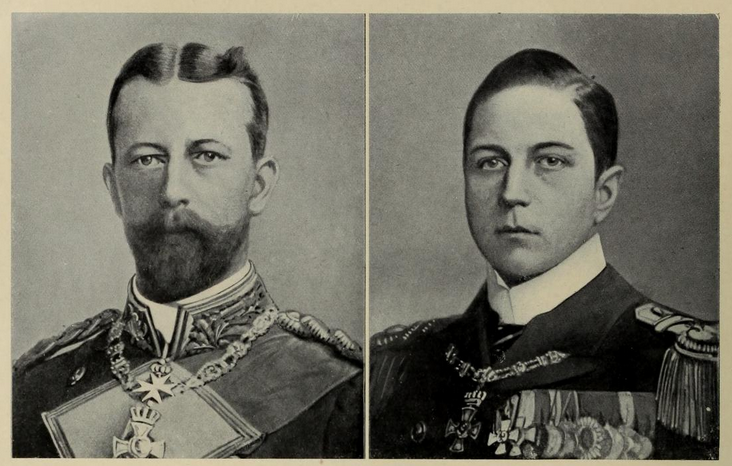 Left: Prince Henry of Prussia, Grand Admiral and Inspector General of the Navy. 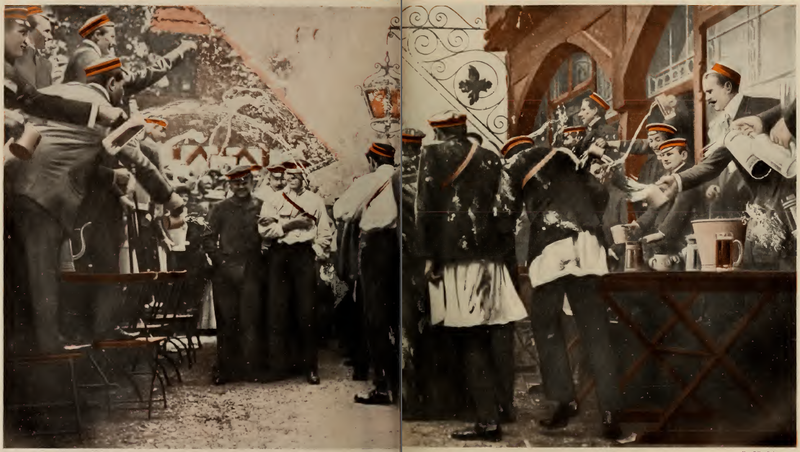 Right: Prince Adalbert of Prussia, third son of Wilhelm II, an officer in the Navy. 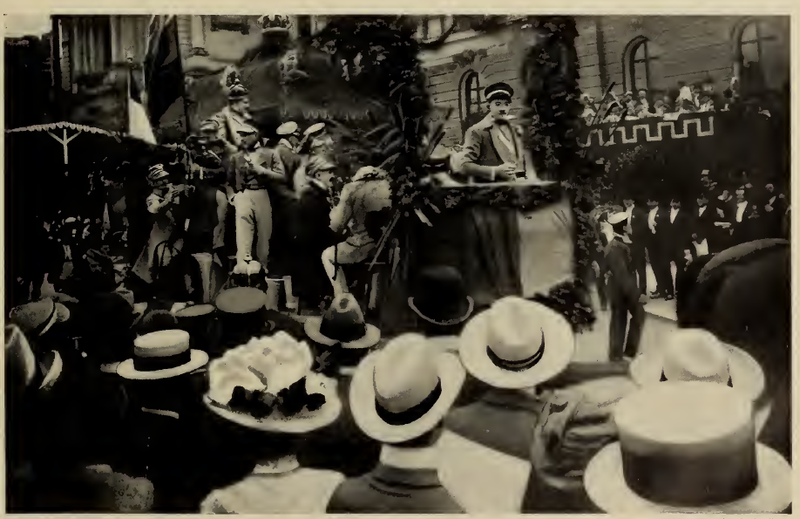 Left: Admiral von Köstler, acting president of the Navy League: the Flottenverein. 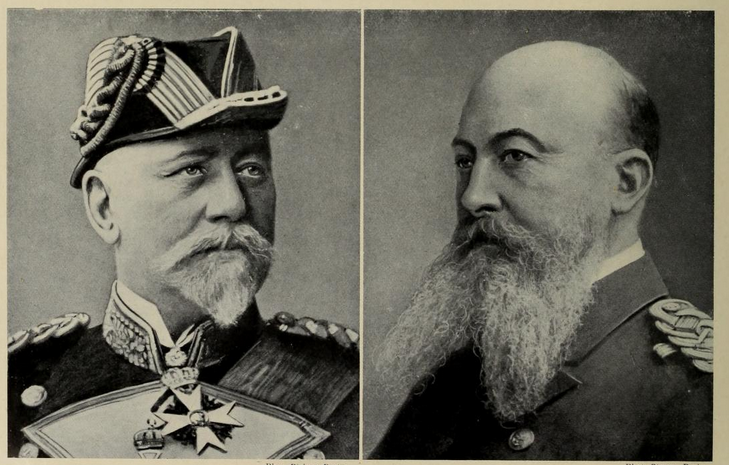 Right: Admiral von Tirpitz since 1897 has been the Minister of the Navy, and high admiral of the navy since 1911. Dreadnoughts. 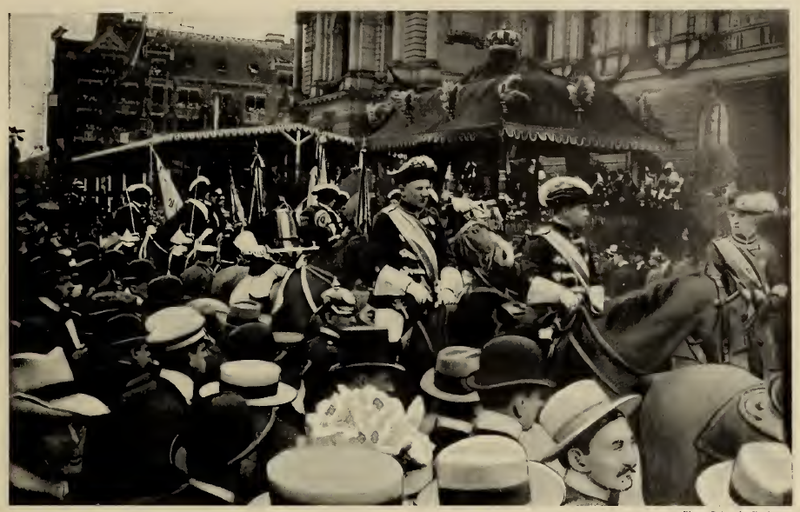 -- The Kaiser is the most modern type of the division. 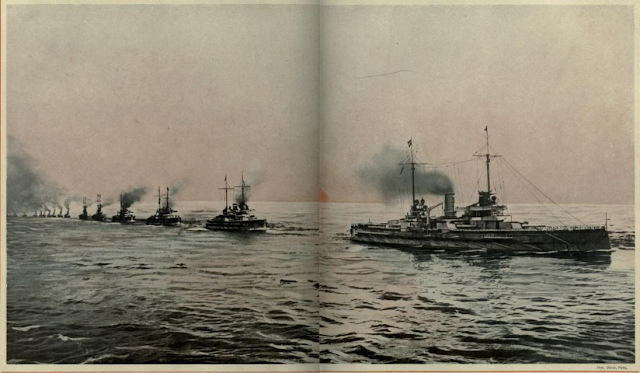 These are ships of 24,500 tons, moving at 23 knots 6, and protected by hardened Krupp steel armour. 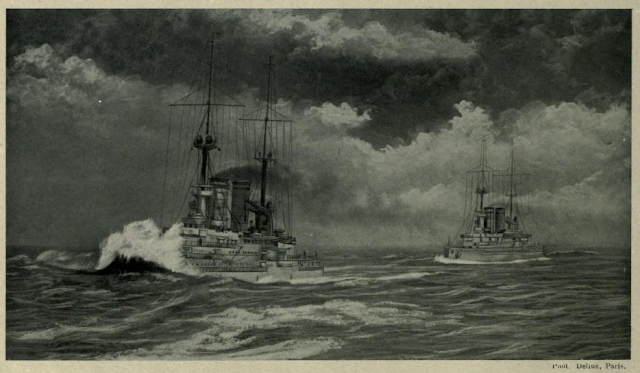 Dreadnoughts. -- The Friedrich der Grosse of the Kaiser class is also in the squadron. 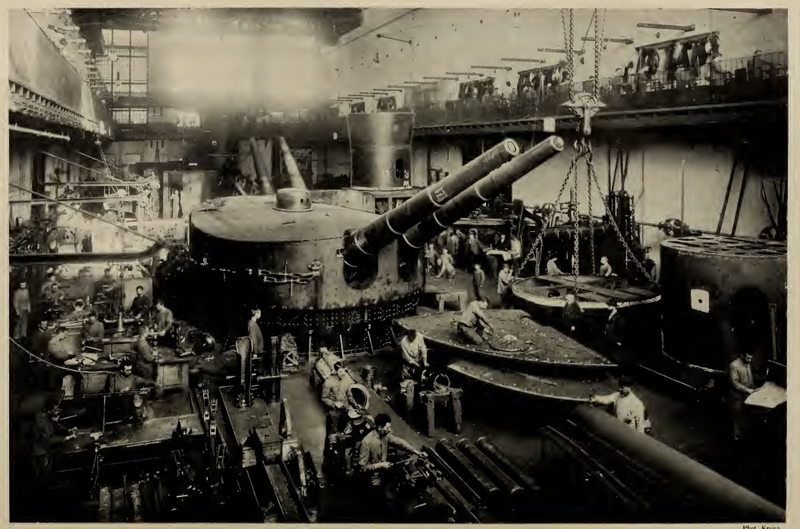 The armament of this ship consists of ten 305 mm cannons, fourteen of 150 mm, and twelve of 88 mm. Dreadnoughts. -- The Prince Regent Leopold is, along with the King Albert, the most recent of the Kaiser class. The ship costs around 60 million. 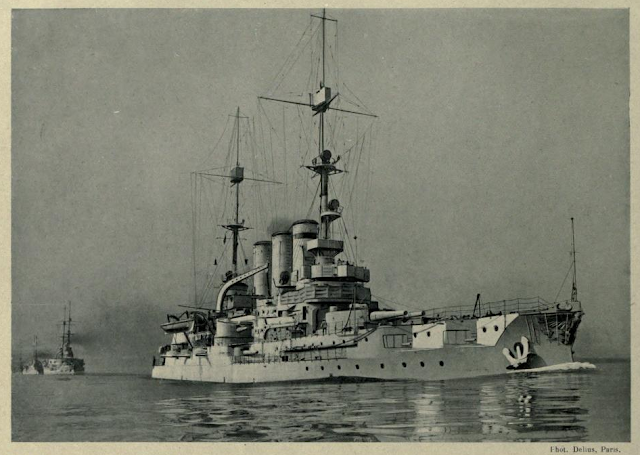 The pre-dreadnoughts, the type the Preussen belongs to, are battleships of 12,000 to 13,000 tons that preceded the dreadnoughts. Their military value is much less considerable. 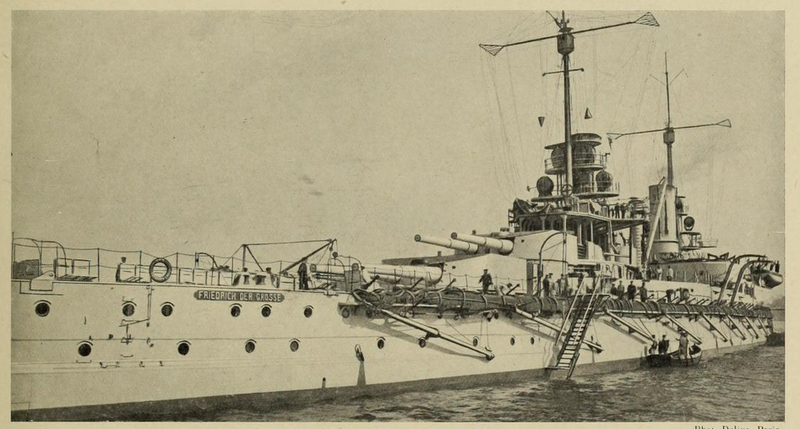 The pre-dreadnoughts, among which the Wittelsbach also ranks, have a number that are still included in the three first squadrons of the battle fleet. Battle cruisers are large fast units with a strength comparable to that of the line battleships. 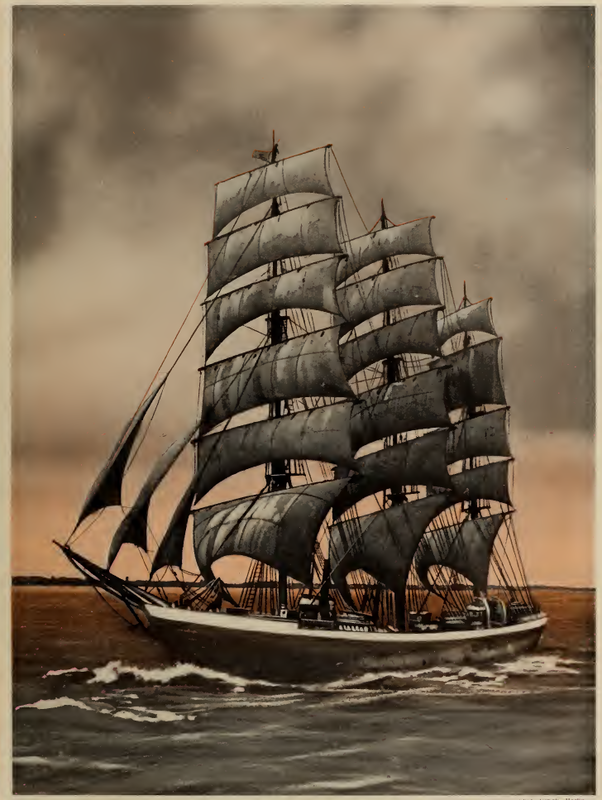 This is the Von der Tann, 19,000 tonnes, sails at 27.6 knots. 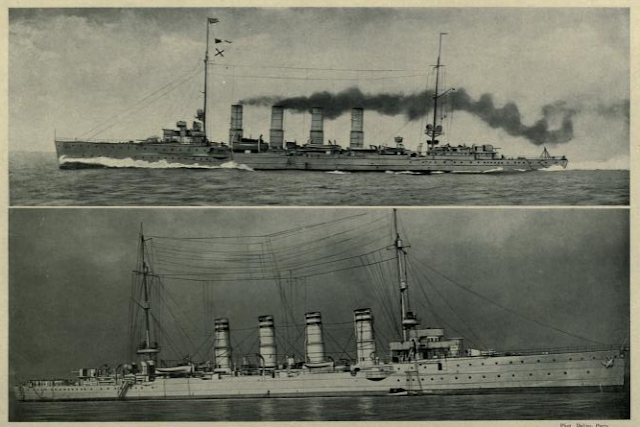 Besides the Van der Tann there are also two Moltke-type units in service, with 24,000 tonnes and a speed of 26.5 knots. The Seydlitz, still under testing, represents a new effort. It has a gauge of 25,000 tonnes and sails at 28 knots. It is armed with 10 pieces of 180 (mm), 12 of 150 and 12 of 88. 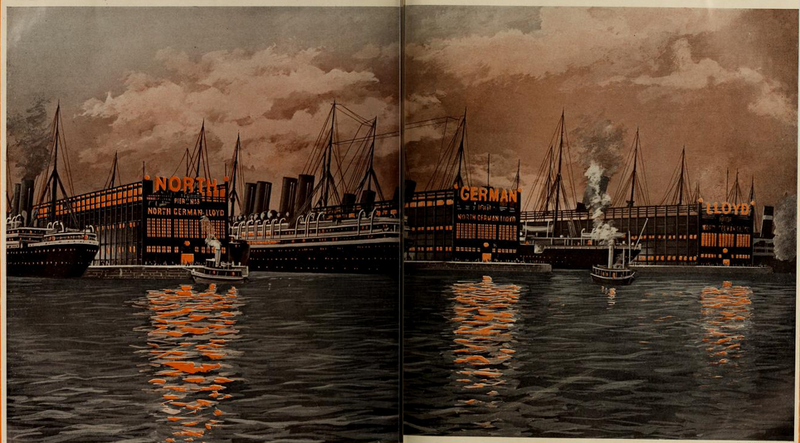 The German fleet in file. -- The active fleet is formed by the first three squadrons, or 24 units under the command of vice-admiral Von Ingenohl. The battle cruisers along with the scouts form a permanent armed squadron under the command of vice-admiral Bachmann. The reserve fleet includes all the other ships forming the fourth and fifth squadrons. The scouts are small quick cruisers (28.3 knots) with just a minimum armament (12 pieces of 105 mm). 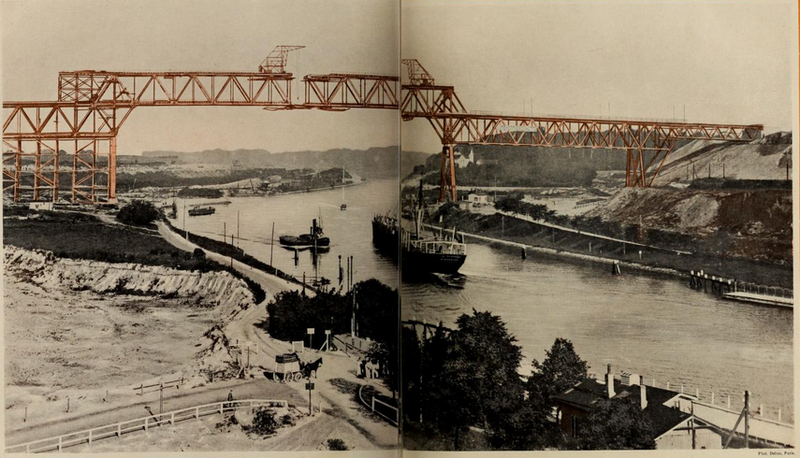 On top is the Strassburg with 4050 tonnes, on the bottom is the Stralsund with 4550 tonnes. In 1920 Germany will have 30 of these small quick units. 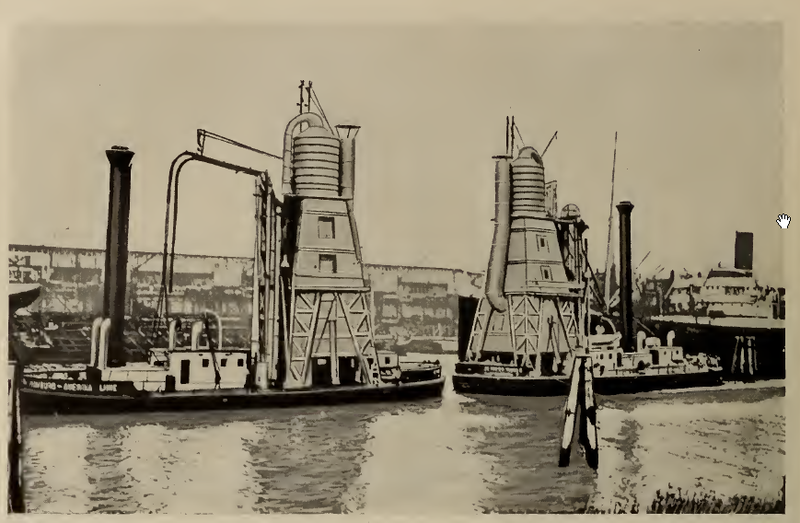 The submarines currently in service number 24. But Germany seems to have decided to put an end to this inferiority and has another 36 under construction. 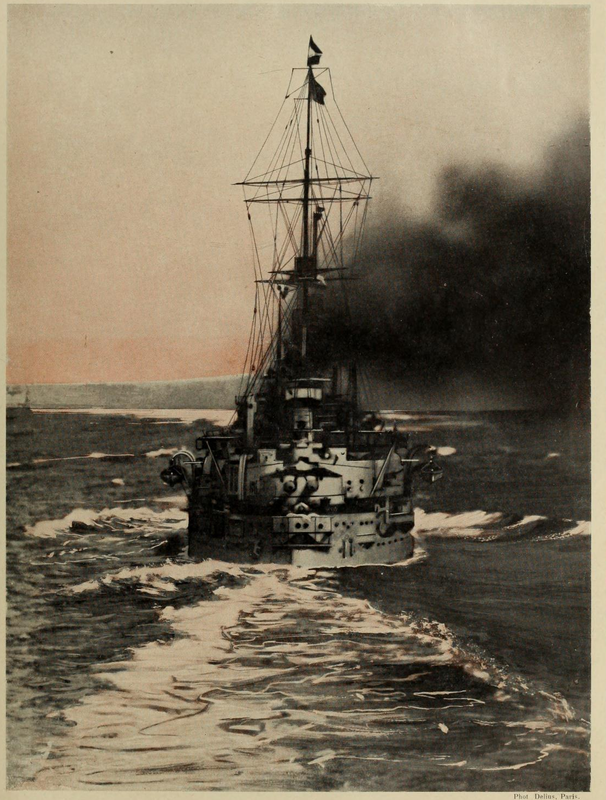 350-ton destroyer cresting a wave. -- The German navy has 132 destroyers in service and 144 under construction. The training of these destroyer divisons is just remarkable. The submarines continue to increase in tonnage, moving towards a type reaching 6,000 tonnes. But they don't seem to have reached a very high degree of perfection. Relaxing on board. The crew enjoys this in particular. 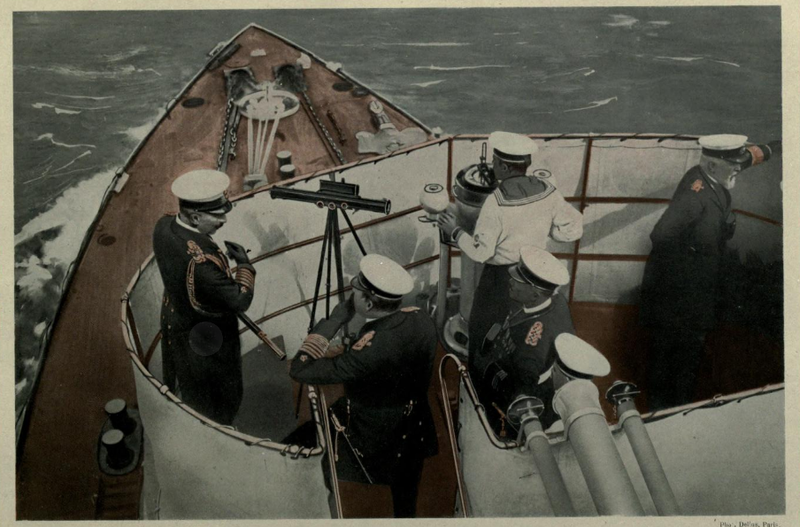 Naval service is indeed harsher than that in the army, and discipline is very severe. Left: Painting the cannonts usually with white or grey. Middle: cleaning the machine guns on board. 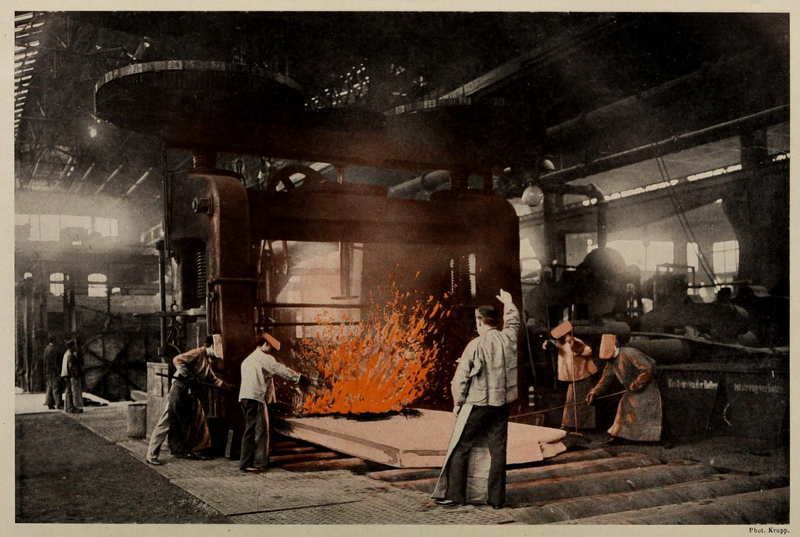 Right: a sailor leaving the boiler room via a cover. 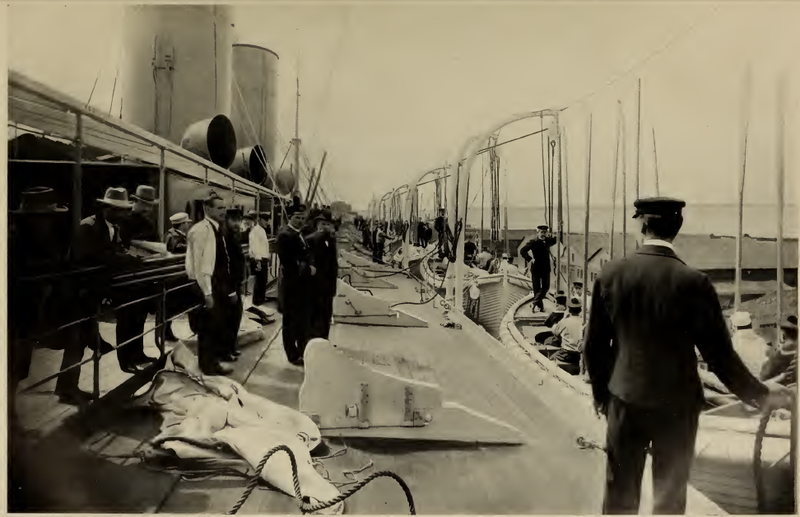 Left: cleaning the deck. Right: installing equipment on board a destroyer. 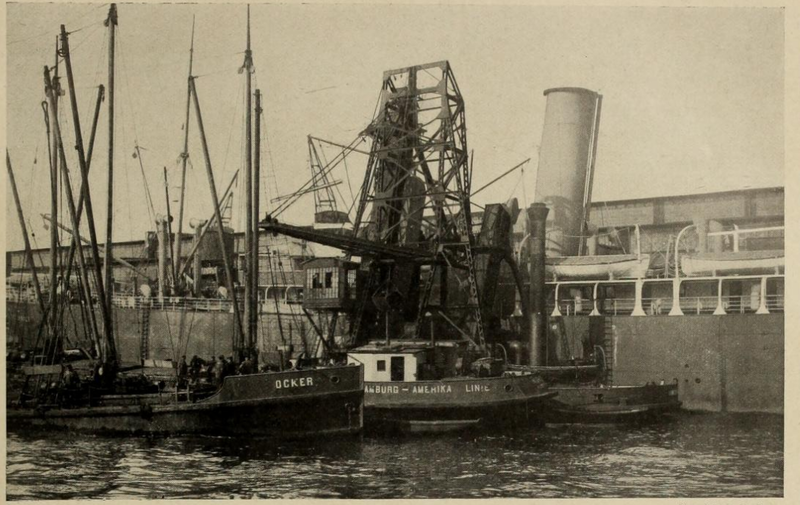 Restocking coal at sea. 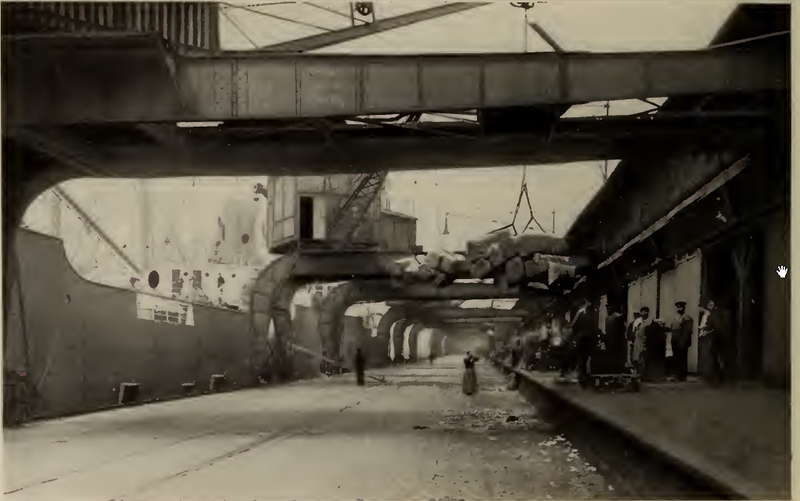 -- With the coal ship anchored in the waters near the ship, they use ropes to create a system with bags going back and forth that have a capacity of about 50 kg each. The Emperor on the bridge. -- The Emperor enjoys wearing the naval uniform and prides himself on knowing the job to a professional level. He plays a leading role in the designation of command, making him truly the head of the navy. Lubeck. 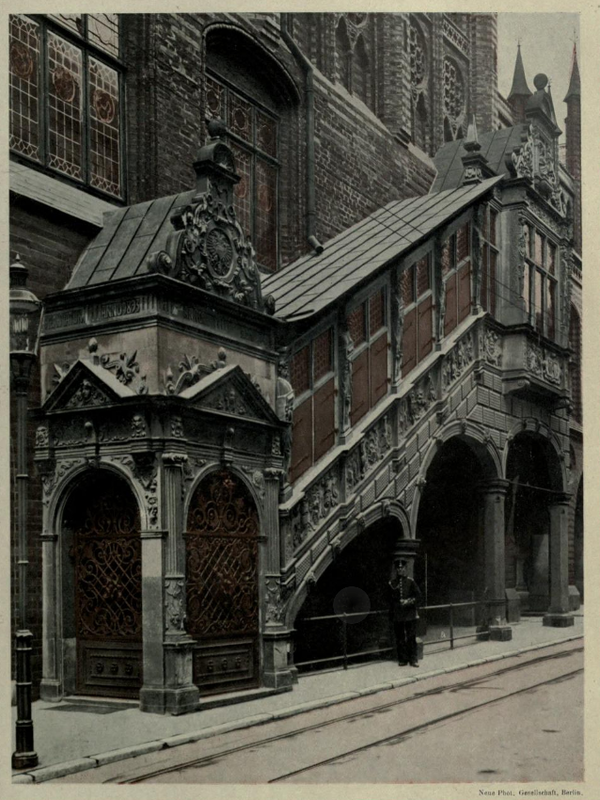 -- The stairs of the City Hall (Rathaus) were added in 1594 to the main building, which dates back to the 14th century, the era when the Hanseatic capital was at its apogee. 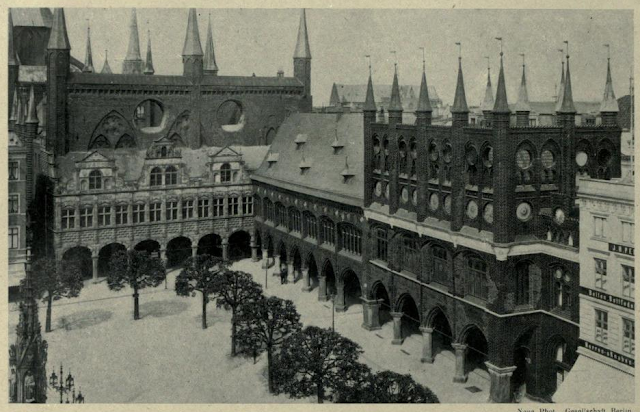 The Rathaus at Lubeck belongs to this gothic-type brick construction that Lubeck had much cultivated during the blossoming of the Gothic style. 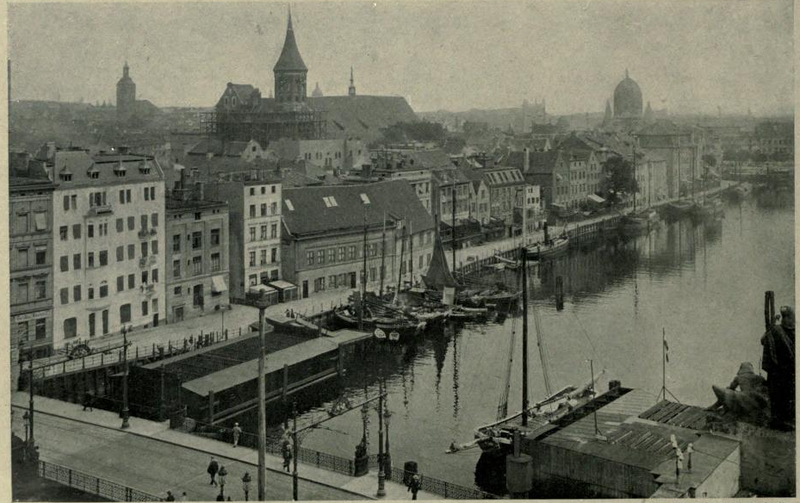 Lubeck. 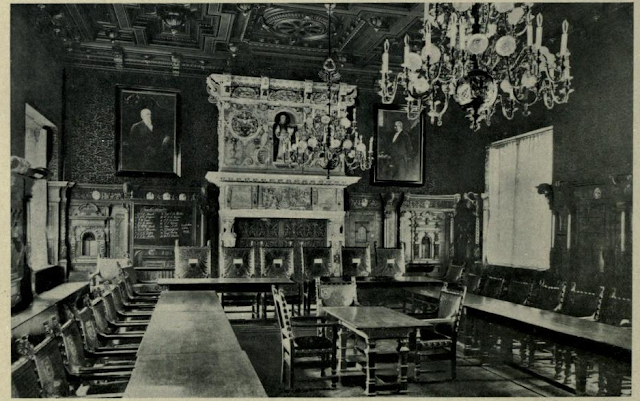 -- The war room (Kriegsstube) of the Rathaus where the door, the paneling and above all the marble hearth with bas-reliefs in alabaster are remarkable productions of 14th-century art. Danzig. -- The Langegasse is one of the main streets of the old city, bordered by houses of 16th, 17th and 18th-century gables, where you can relive the past. Danzig. 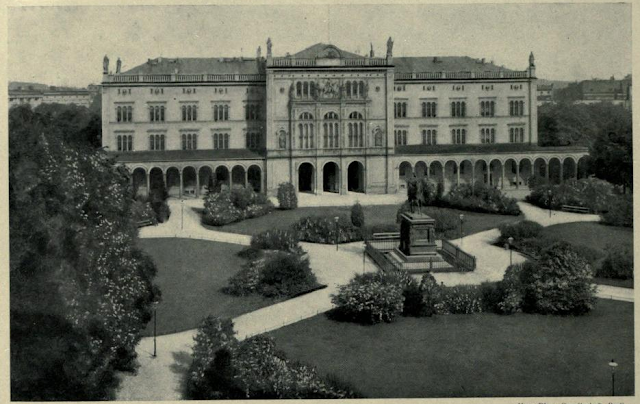 -- The Zeughaus is the former armoury built in a Flemish Renaissance style, with the picturesque street called Jopengasse out front. Danzig. -- The Milchkannentor (milk can tower) rises above the quay of Mottlau, facing the island of Speicher-Insel (storehouse island) where the stores can take in 100,000 tons of cereals. Danzig. -- The Grüne Tor (green tower) raised in 1568 serves today as a museum and contains collections of natural history and prehistory. Danzig. -- The commerce exchange (Artushof) is decorated with murals on which here and there stand a trophy, a deer's head with powerful antlers, breastplates, and banners. 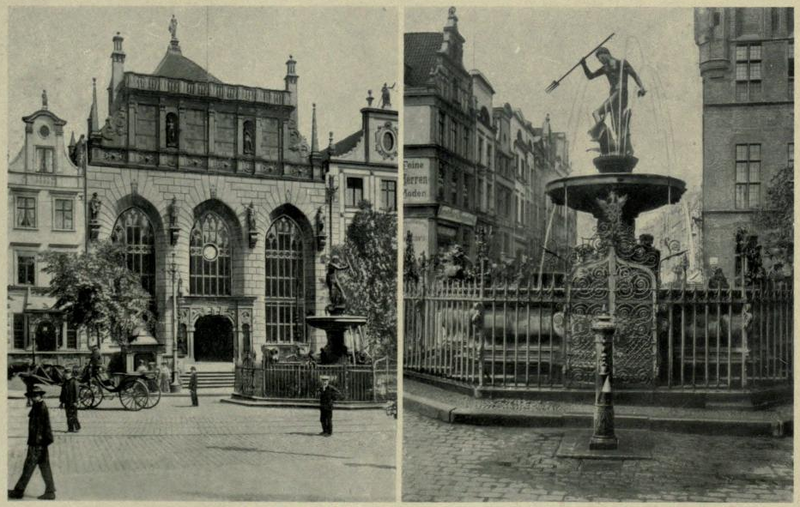 Left: The Artushof, now a commerce exchange, used to be a merchant house. Right: The Fountain of Neptune, raised in 1633, rises over the Langemarkt. Königsberg. -- The banks of Schlossteich. -- The Schlossteich (Palace Pond). This vast lake gives a bit of life to this sad and asphyxiated city. 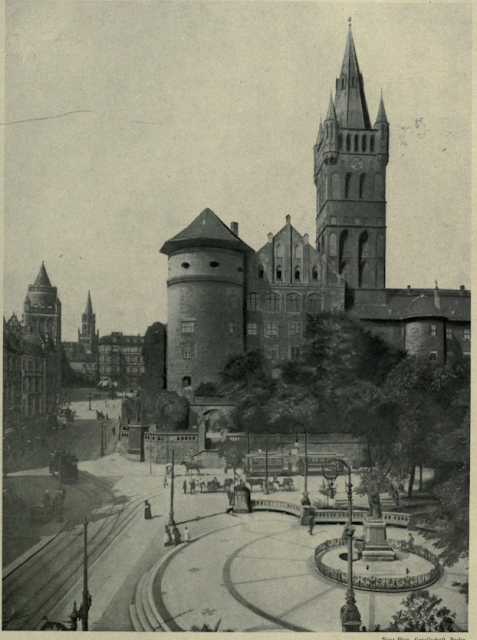 Königsberg. -- The University, founded in 1544, only has 1,300 students in spite of its large number of collections. The famous philosopher Kant was a professor here. Königsberg. 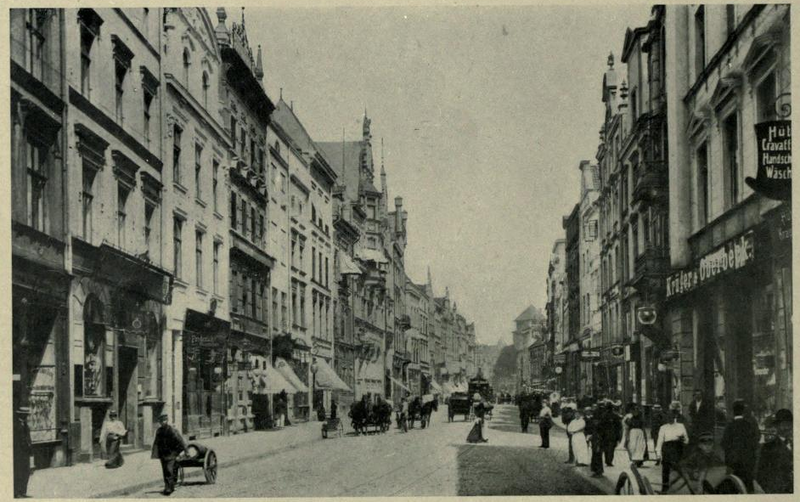 -- The Langegasse is one of the main streets. 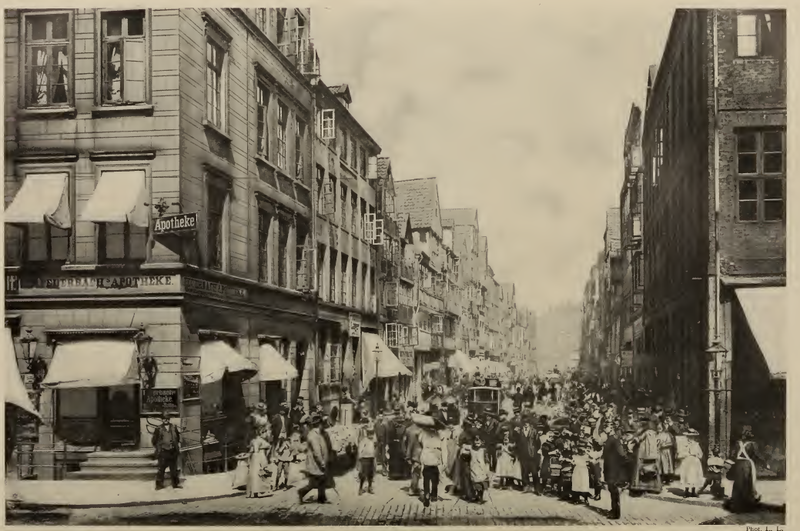 The most lively streets of the city are narrow and the houses are banal. 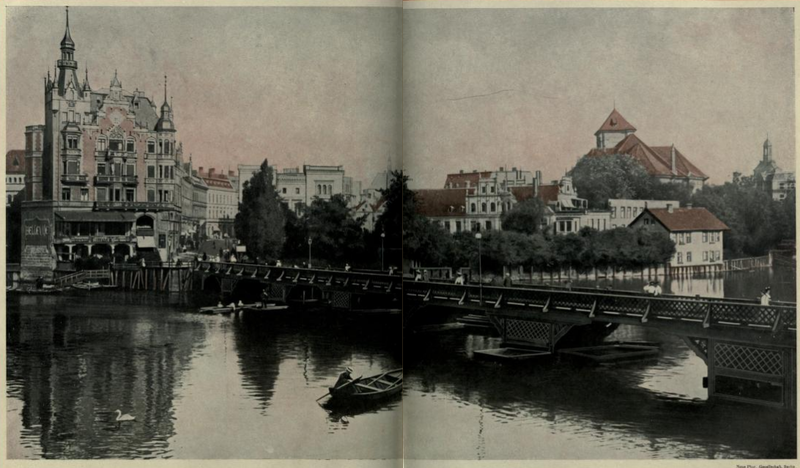 No rich quarters, no lavish houses, for Königsberg is very poor. Königsberg. -- The Castle, the old residence of the Grandmaster of the Teutonic Order and the Prussian dukes, rises, massive and cold, over a slight hill overlooking the Pregel river. Königsberg. -- The fish market on the quay of the Pregel, is the only truly picturesque part of the city. 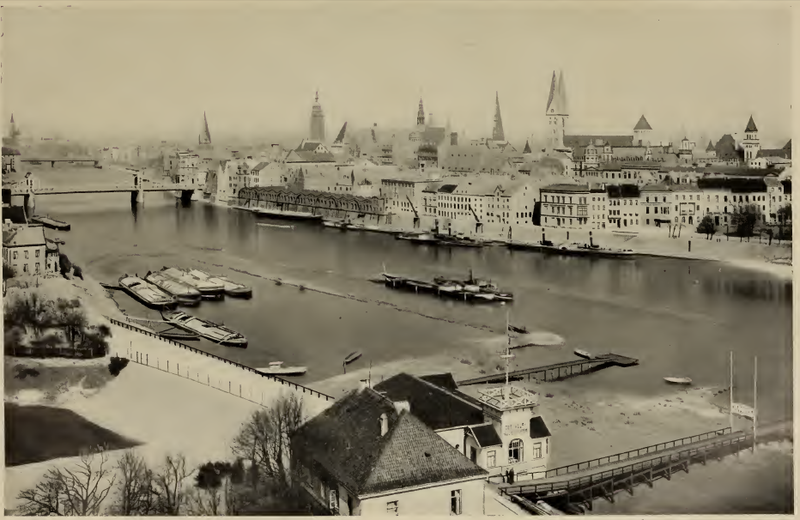 Königsberg. 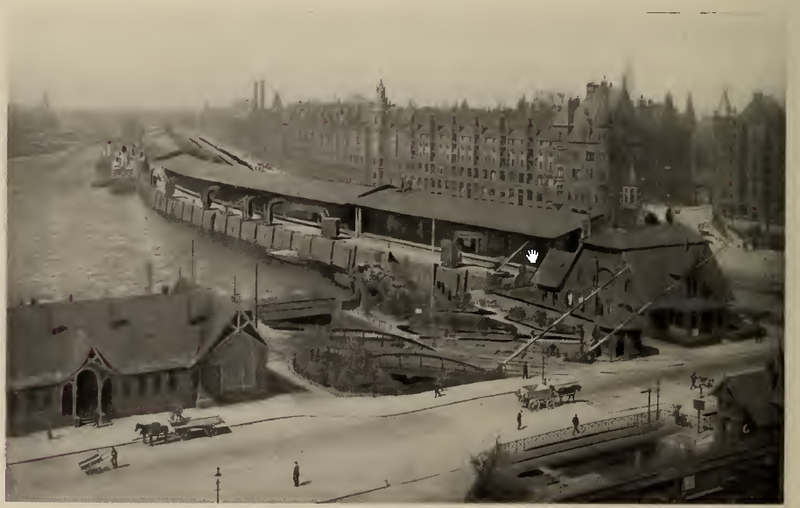 -- The quay of the island formed by the Pregel. -- It's on this island that the cathedral is located. You can see two towers of which one is incomplete. Kant is buried close to the presbytery.